(ca. 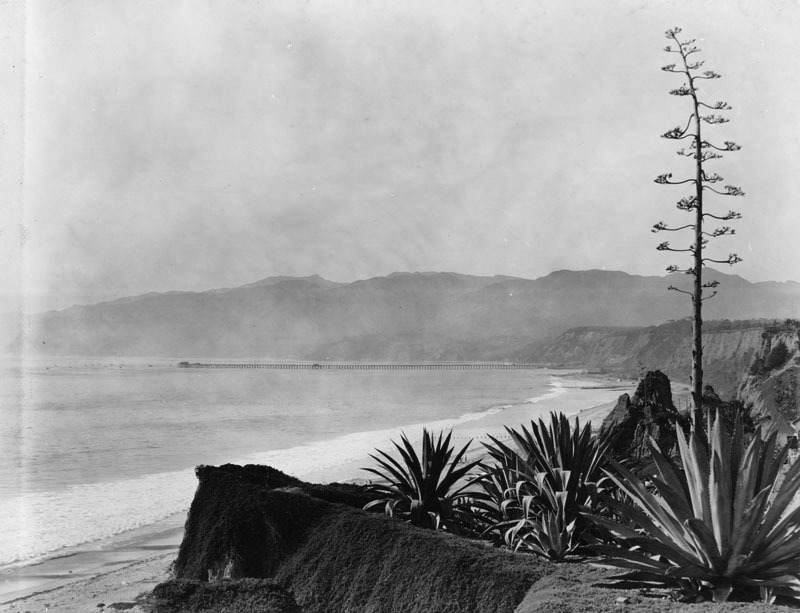 1905)** - View of the Santa Monica shoreline from Palisades Park. The tracks of the Los Angeles & Independence R.R. run where Pacific Coast Highway is today. 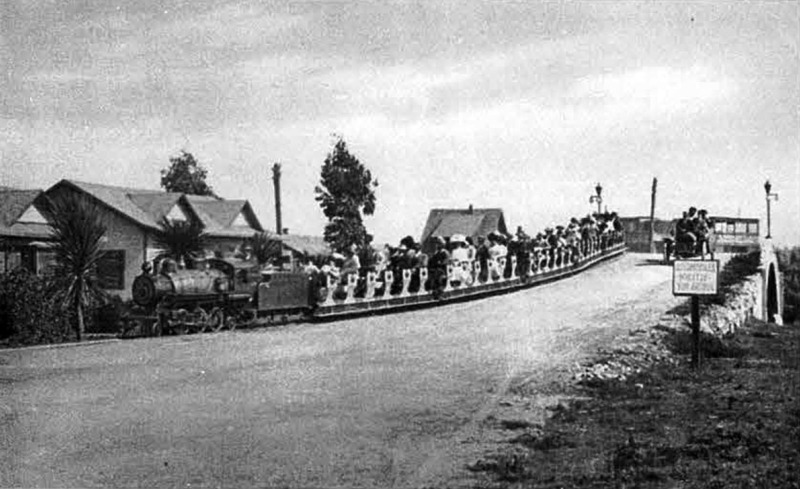 To the right, a motorcar ascends an early version of the California Incline. (ca. 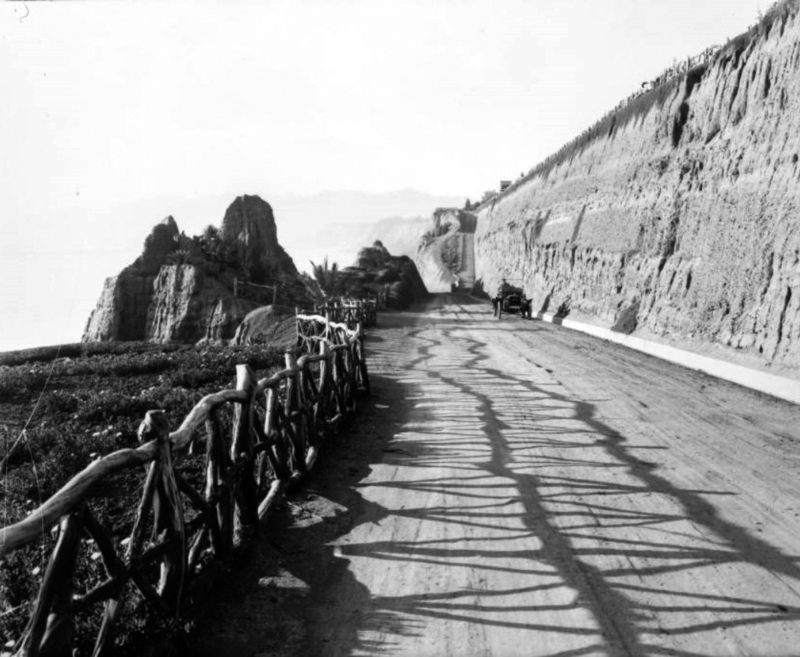 1905)** - Early view looking up the California Incline leading from the coast highway to the palisades. There is a walking path to the right of the road. 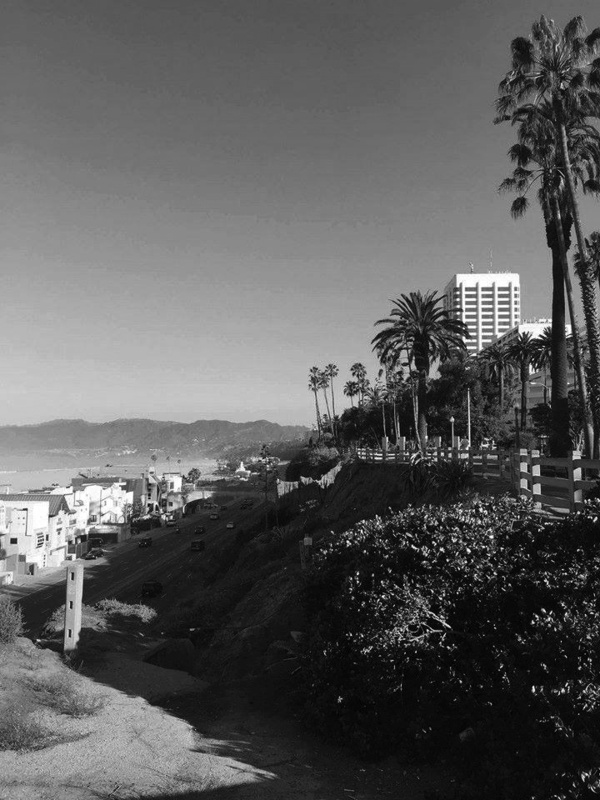 Today, the California Incline is a vital street in Santa Monica, linking the PCH with Ocean Avenue, and California Avenue, bisecting Palisades Park. 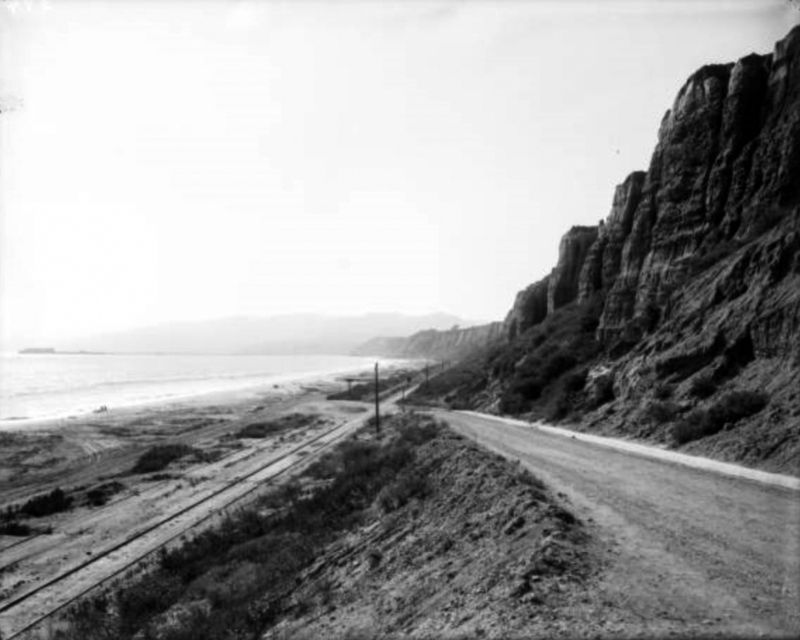 It begins at an intersection with Ocean Avenue and California Avenue, at the top of the palisades, extending to the PCH at the base of the bluffs. (ca. 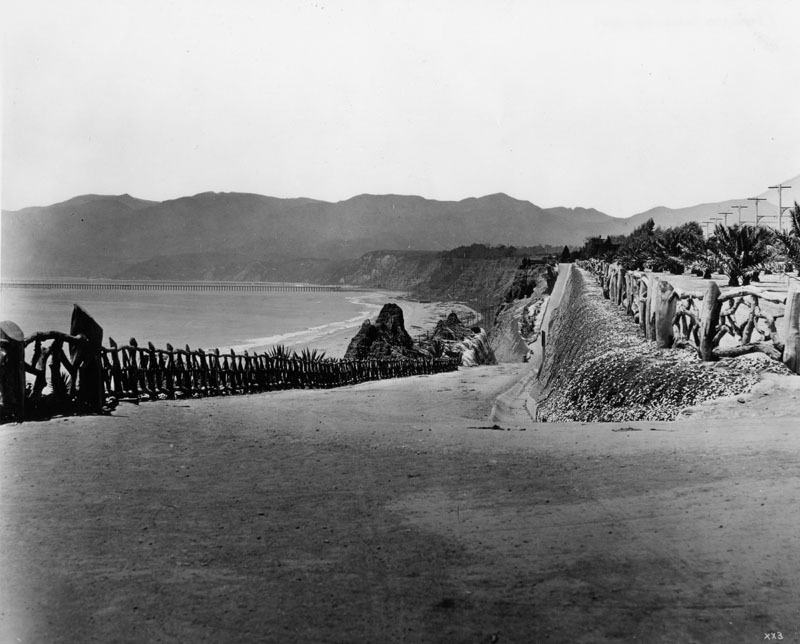 1905)* - View shows a wooden fence along an unpaved California Incline with the Long Wharf seen in the background. The Santa Monica mountains are in the distance. 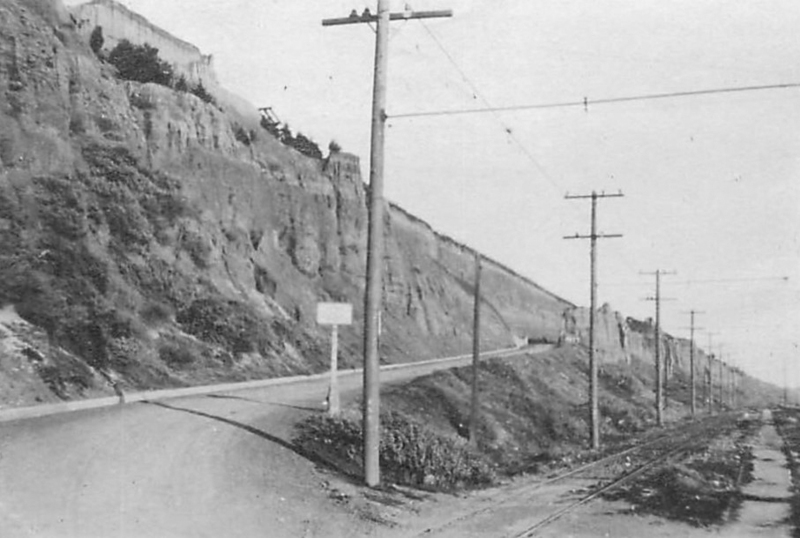 Linda Vista Park (later Palisades Park) is on the right. (ca. 1910)^*## – Postcard view showing a woman standing on the California Incline watching a car as it makes its way up the grade. The Long Wharf can be seen in the background. However, just a short four years after the Long Wharf's construction, San Pedro Bay was chosen over Santa Monica to be the main seaport of Los Angeles. Click HERE to see more in Early Views of San Pedro and Wilmington. 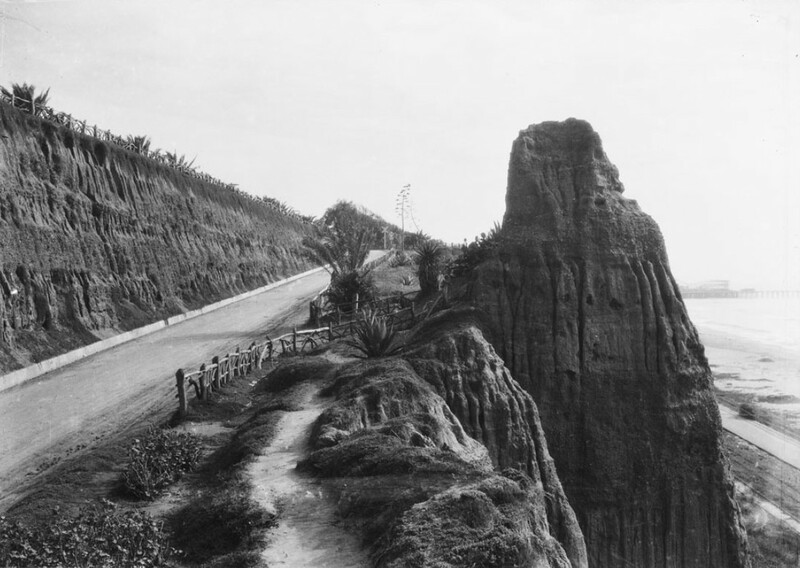 (1910s)#^^ – View showing an automobile driving south up the California Incline in Santa Monica. The rustic fence is on the left, and the bluffs on the right. Note the pedestrian trail at center-top. (ca.1910)** - View showing the Santa Monica coastline, looking south from Linda Vista Park (later Palisades Park). The palisades are at left and are a line of steep, rocky cliffs. A twisted wood fence runs along the top edge of the cliff, and several wooden structures can be seen beyond the fence. A wide unpaved road runs up the face of the cliffs at center. At right, the ocean is visible. 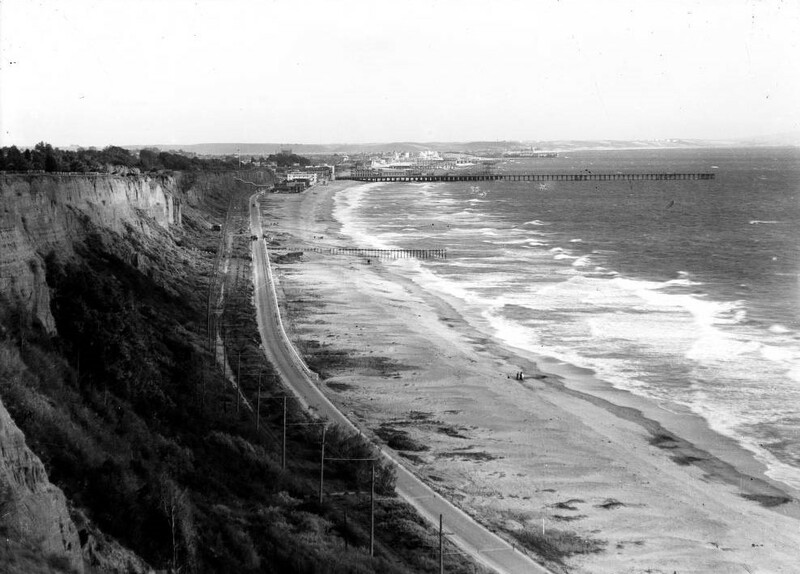 A set of railroad tracks and Beach Road (later Roosevelt Highway and the Pacific Coast Highway) can be seen at center, running parallel to the shoreline down to where Santa Monica Municipal Pier (1909) juts out into the water. 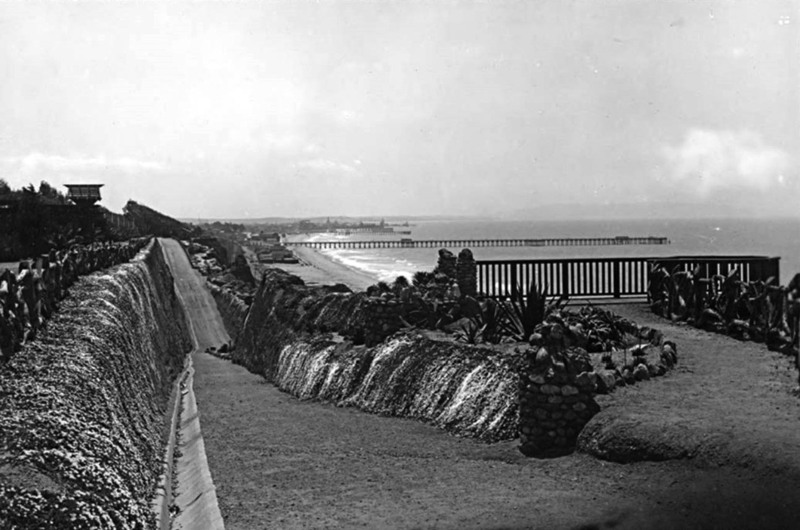 (1910s)#^^ - View from Palisades Park looking down a pedestrian trail that intersects the California Incline road, with the beach, and Santa Monica Pier and Ocean Park amusement piers in the background. Note the observation deck at right. (ca. 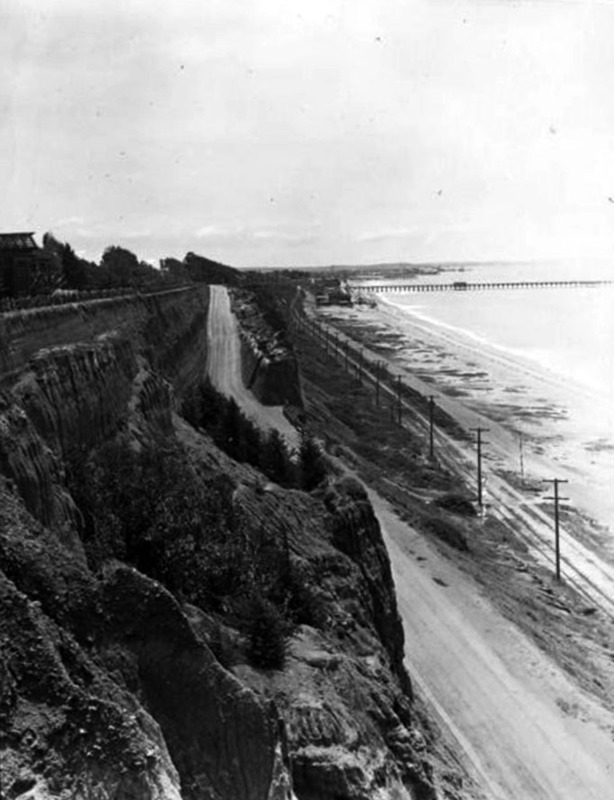 1905)#^^ - View looking down the California Incline road in Santa Monica towards the beach and railroad tracks. The Southern Pacific Railroad ran steam engines along these tracks between Los Angeles and the Long Wharf (seen in distance at left). A few telephone poles can also be seen, as well as the wagon trail that ran alongside the railroad tracks. (ca. 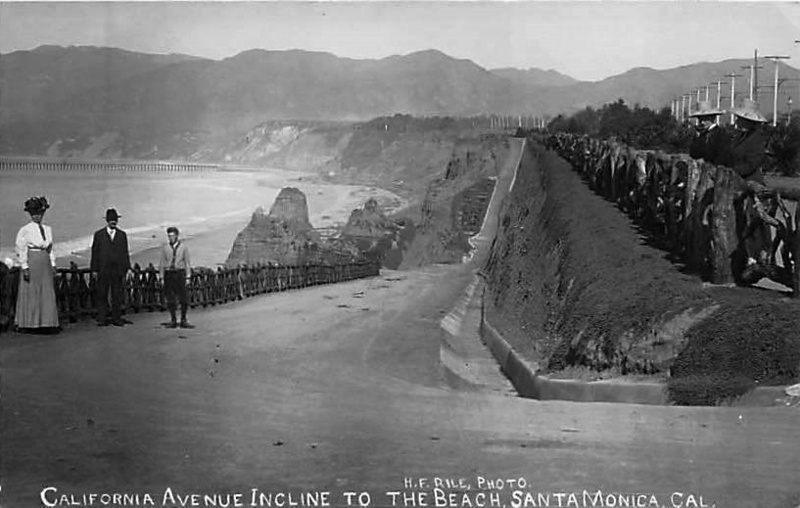 1910)#^^ - View looking south at the California Incline road coming down from the bluffs to the beach, in Santa Monica. 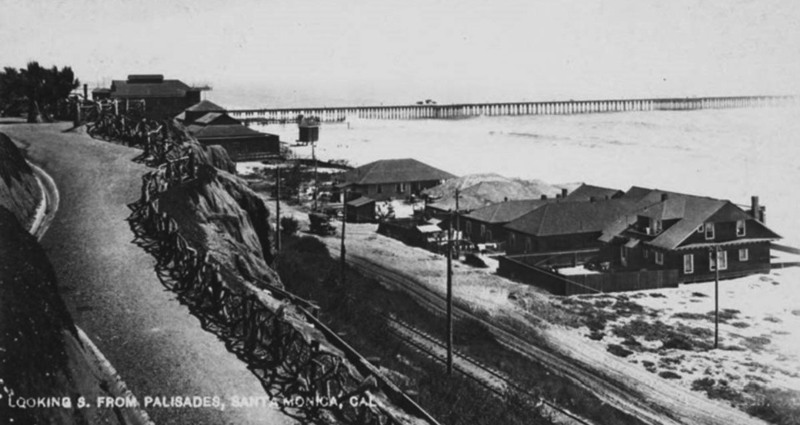 The Santa Monica Municipal Pier (1909) is in the distance. Railroad tracks can be seen running along the beach road below. 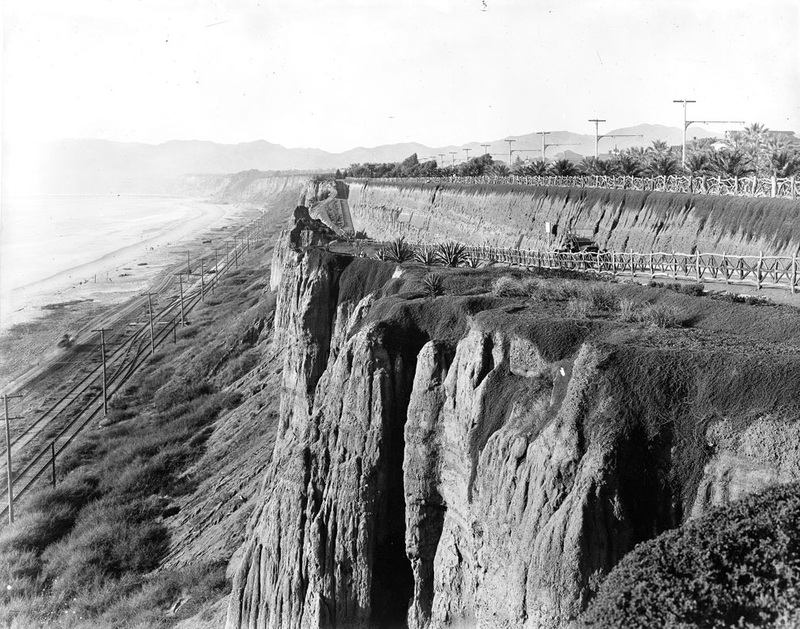 (1912)**^ – View looking up the California Incline from near the tracks along the beach. (ca. 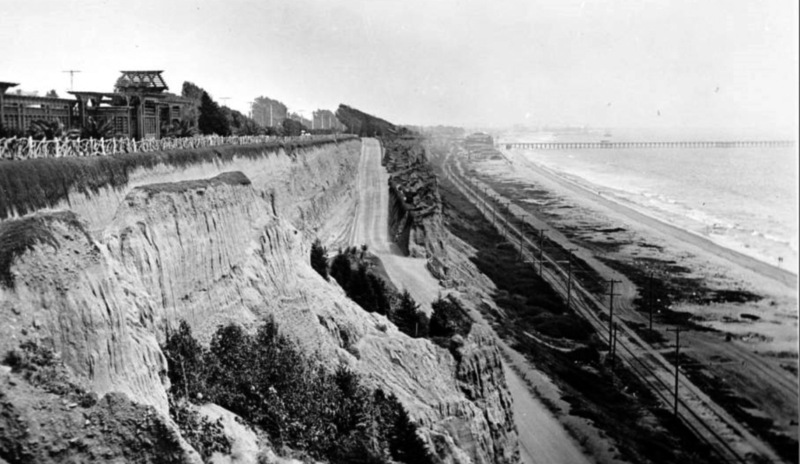 1913)** - Panoramic view of Santa Monica Beach looking north from the California Street incline. The ocean and shore are visible to the left, down from the cliff along which a paved road runs, lined to either side by a post-and-rail fence made from rough-cut branches. A second, higher road stands directly next to the first, at the right. Mountains are visible stretching out into the water in the background. Plants that appear to have been put there rather than growing naturally stand along the left side of the road. 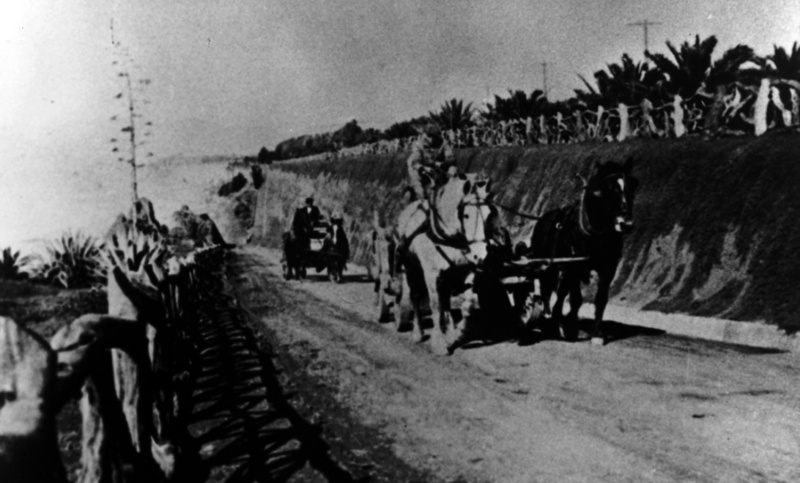 (1915)^#* – View of two horse-drawn wagons hauling freight up the California Incline. (1910s)^x^ – Postcard view looking down the California Avenue Incline with the Long Wharf (1893 – 1920) seen in the distance. A man, a woman, and a child are posing for the camera at left. On the right, two people with ‘cool’ looking hats are standing behind the rustic wood fence at Linda Vista Park (Pacific Palisades Park in 1920). (ca. 1920)^^ - Panoramic view shows two people standing by the fence along Palisades Park looking south toward the Santa Monica Pier and the Palos Verdes Peninsula. Another person is seen walking along the fence-lined path. Two large ships are seen between the pier and peninsula. (1920s)#^^ - Postcard view showing the California Incline and Palisades bluffs, lined with rustic wood fence, leading down to the beach at Santa Monica. 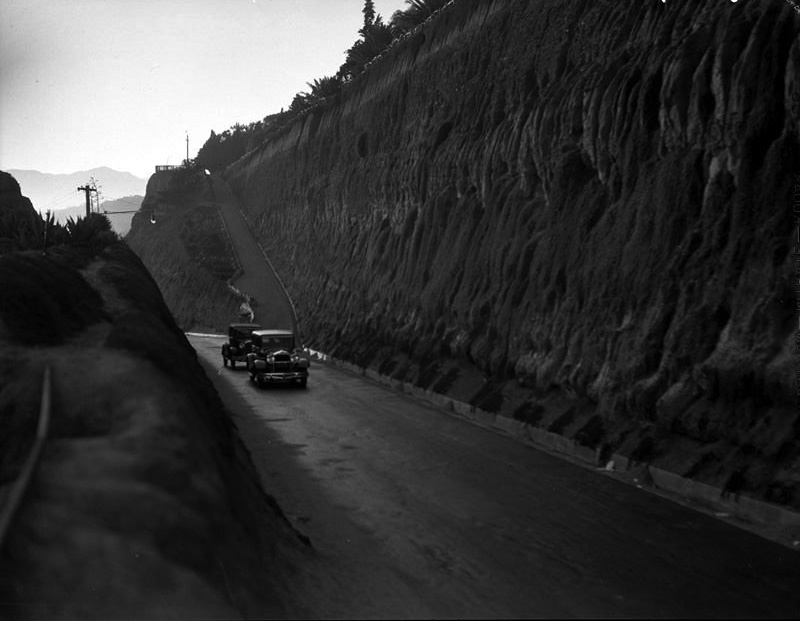 (1924)^x^ - View showing two early model cars driving up the California Incline with pedestrian trail seen in the background. 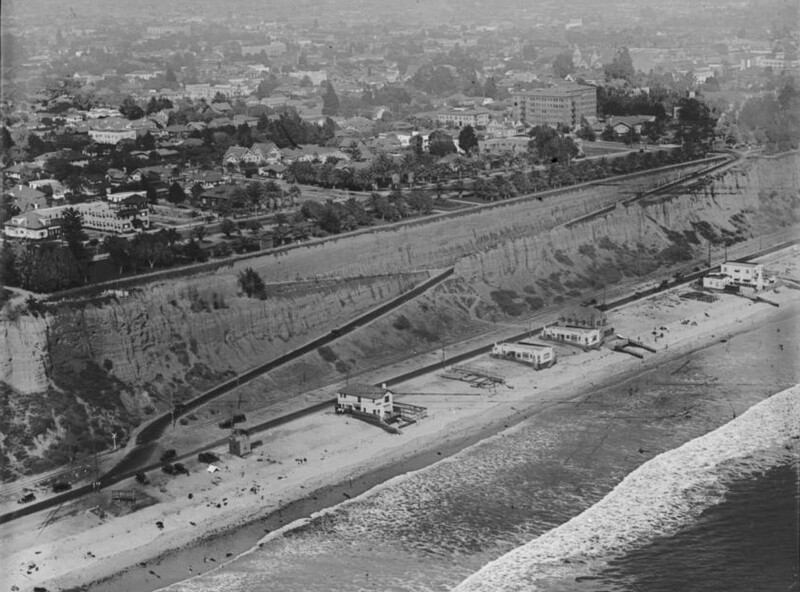 (1920s)#^^ - Aerial view of the coastline in Santa Monica, showing the California Incline road running through the bluffs, with beach houses along the coast and Palisades Park and buildings above. (ca. 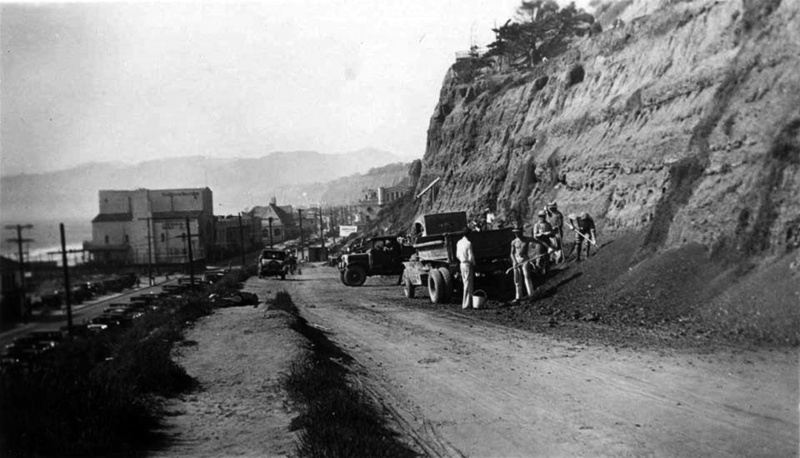 1929)^x^ – View showing construction crews working on widening the California Incline. 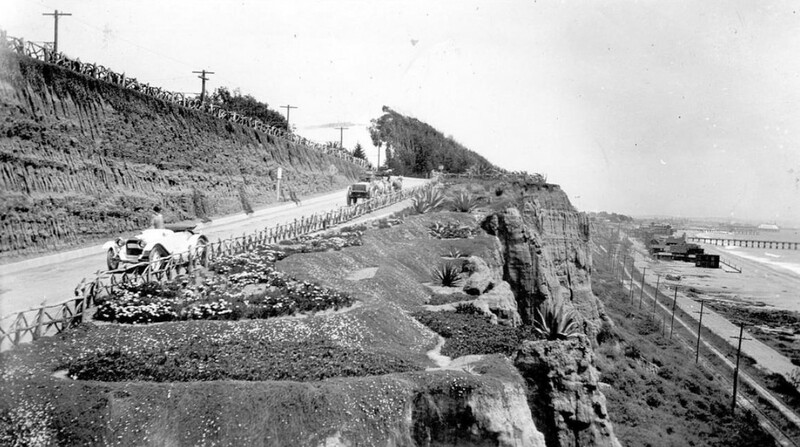 Click HERE to see more early views of the California Incline (1930 +). 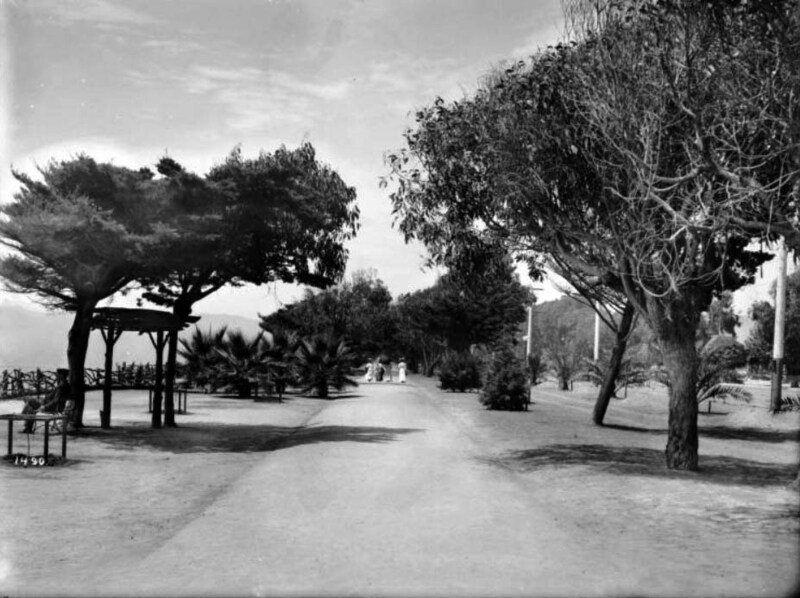 (1910s)#^^ - View of Sunset Trail from Linda Vista Park (present day Palisades Park) to Palisades Beach Road in Santa Monica. A sign hangs from a rustic wooden archway that reads "Sunset Trail to Palisades Beach Road." 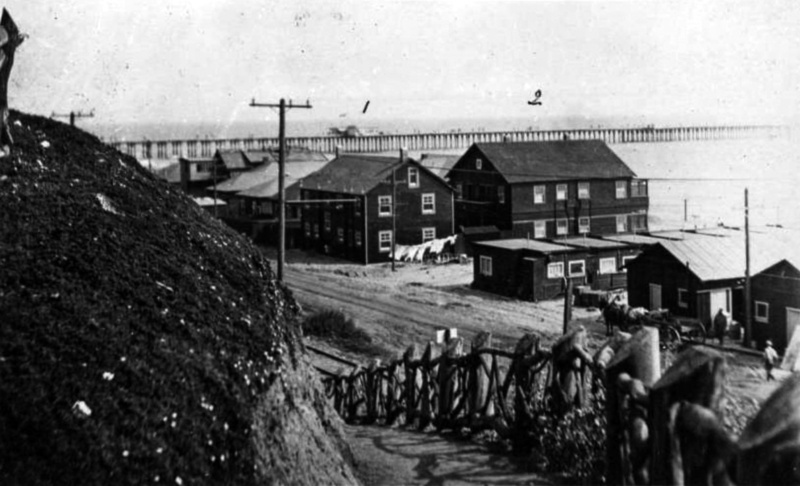 The 99 Steps can be seen over the Beach Road (later part of Pacific Coast Highway) at left and the Long Wharf is visible in the distance. (1910)#^^ - Postcard view of showing houses, a dirt coast road, an automobile and railroad tracks along the beach at Santa Monica, with the Santa Monica Municipal Pier (built in 1909) in the background. The Sunset Trail is seen on the left. 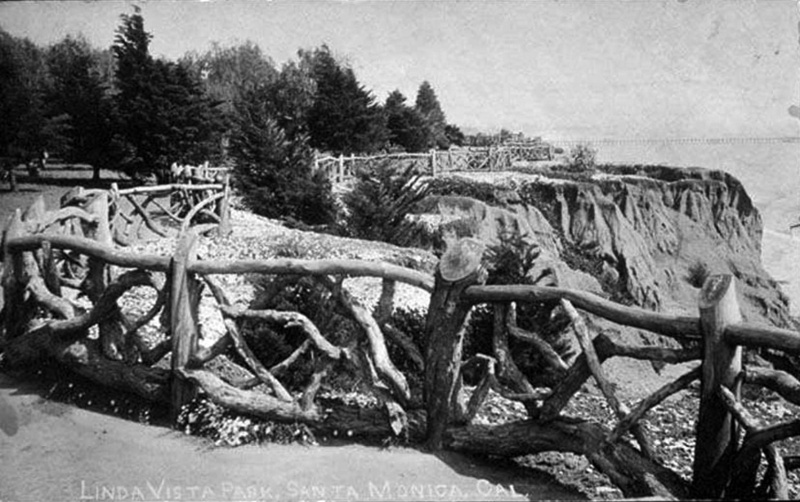 (1914)#^^ - Image of the rustic fence from Linda Vista Park (later Palisades Park) leading down to the Beach Road (later Pacific Coast Highway) with a horse-drawn wagon parked next to houses along Sunset Beach. The Santa Monica Municipal Pier is visible in the distance. (ca. 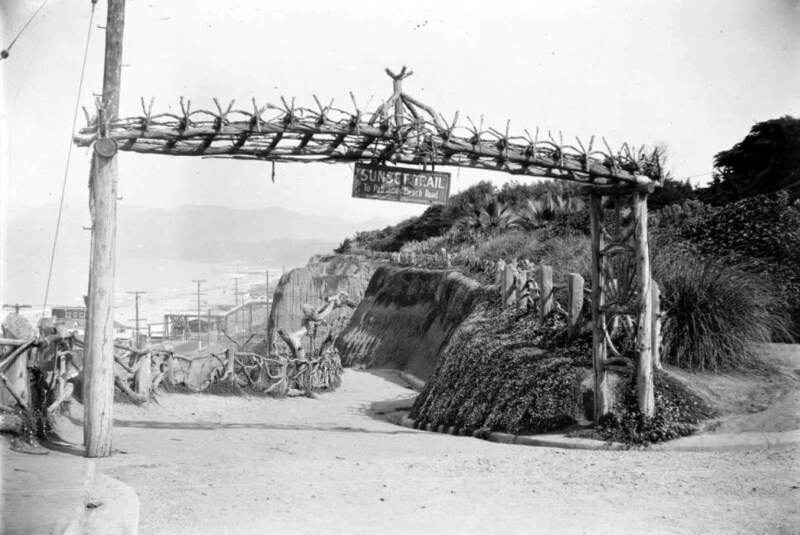 1920)** - Entrance to the Sunset Trail at Santa Monica's Palisades Park (originally Loma Vista Park). The trail is at center and heads down the steep face of the cliffs that give the park its name. The trail is bordered on the left side by a wooden fence made from twisted tree branches. The entrance to the trail is marked by a large wooden sign supported by a wooden framework made of tree trunks. The tops of the cliffs are at right and are covered with an assortment of bushes, and the ocean is visible in the background at left. The Pacific Coast Highway is at the base of the trail in the background at left and is lined with utility poles and beach houses. 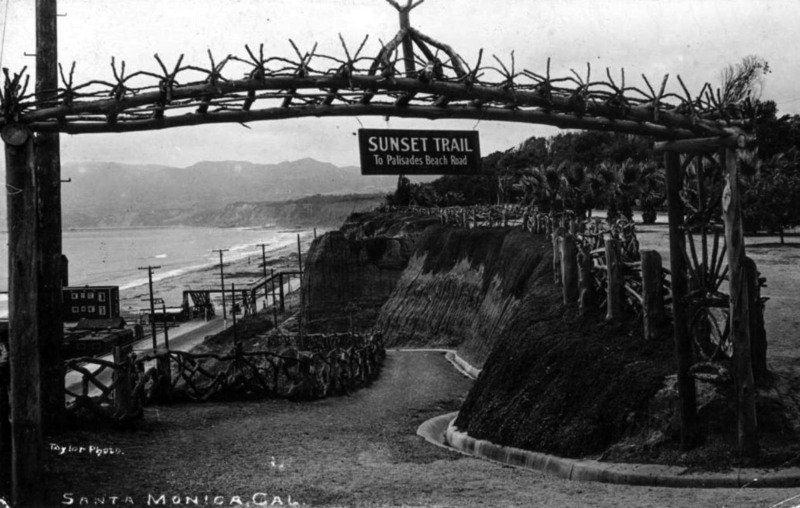 Sign reads: "SUNSET TRAIL - To Palisades Beach Road"
Linda Vista Park was renamed Palisades Park in the 1920s. (ca. 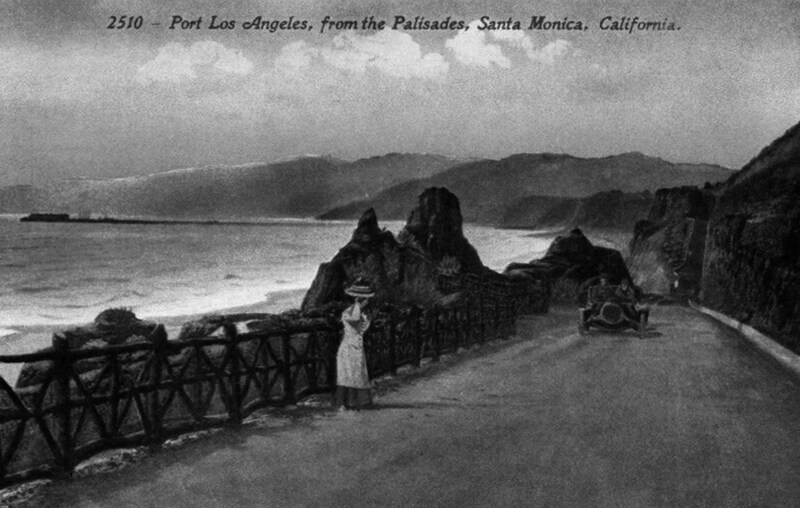 1920s)#^^ - View of the Palisades bluffs above the beach, with a rustic wood fence, and palm trees in Palisades Park. The Sunset Trail path is on the right; a woman is walking down it in the background. 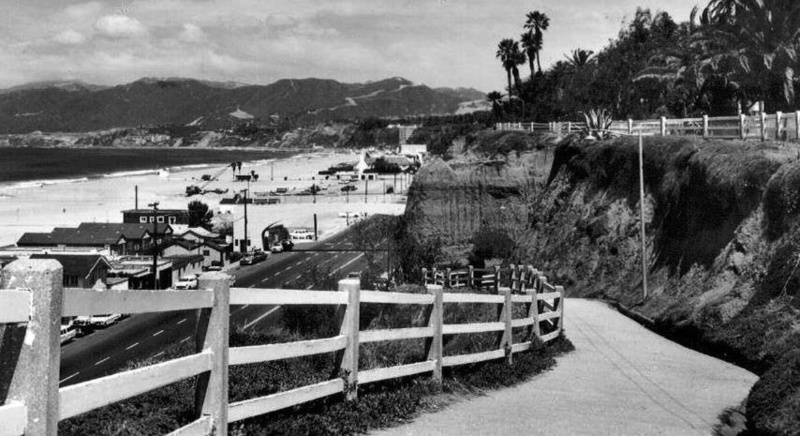 The coast road (later part of Pacific Coast Highway) and buildings on the beach are also in the view. (1950s)^x^ – Postcard view showing Sunset Trail in the early 1950s with Palisades Park (originally Linda Vista Park) seen in upper right. (2018)^^ - Sunset Trail as it appears today. (1900)#^ – View showing Linda Vista Park (later Palisades Park). The Santa Monica Pier can be seen in the distance. (ca. 1909)#^ - View from Linda Vista Park (later Palisades Park) looking south toward the Santa Monica Municipal Pier. 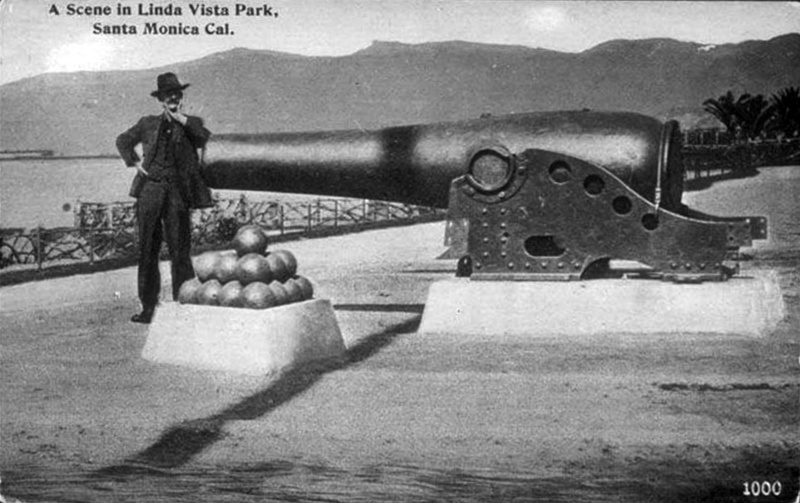 (1908)#^ – Postcard view showing a man leaning on a cannon in "Linda Vista Park" (now Palisades Park). The cannon is an 1861 Rodman seacoast gun that was on loan from the Federal Government. 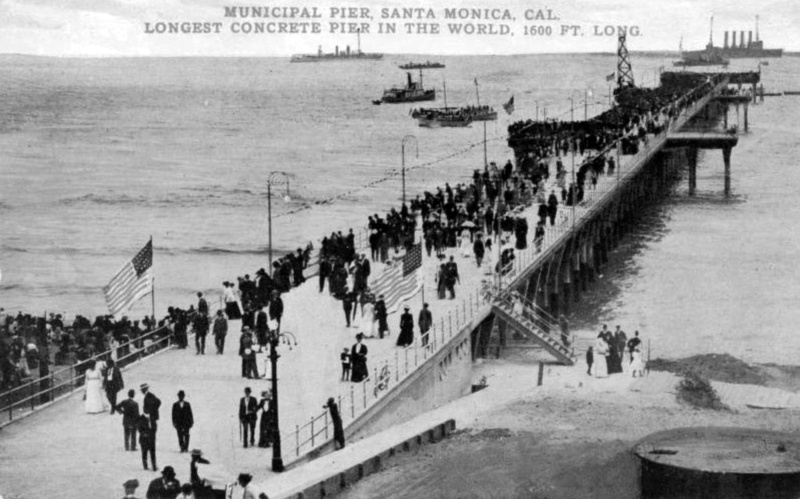 It was brought to Santa Monica in 1908 from San Francisco. (Early 1900s)** - View of four women strolling down the shady lane of "Lover's Walk", along the bluff in Linda Vista Park. Scattered trees line either side of the dirt walking path that runs down center. A lone man can be seen sitting on a bench under a tree looking out at the ocean at left. 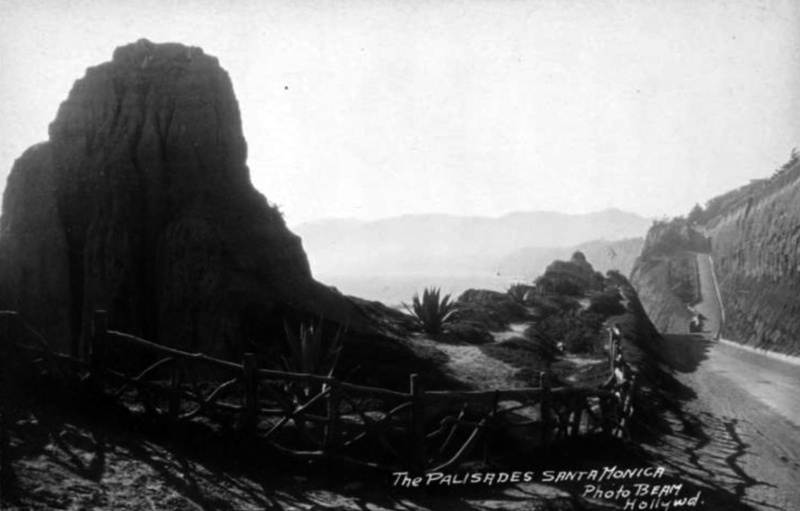 (Early 1900s)^^ - View looking north from Linda Vista Park (today, Palisades Park) near the top of the California Incline. The Long Wharf can be seen in the distance. (ca. 1900)^*## – Panoramic postcard view showing Ocean Park. The "Wave w/ Furnished Rooms" can be seen in the background. "Lunch Counter" is on the right. 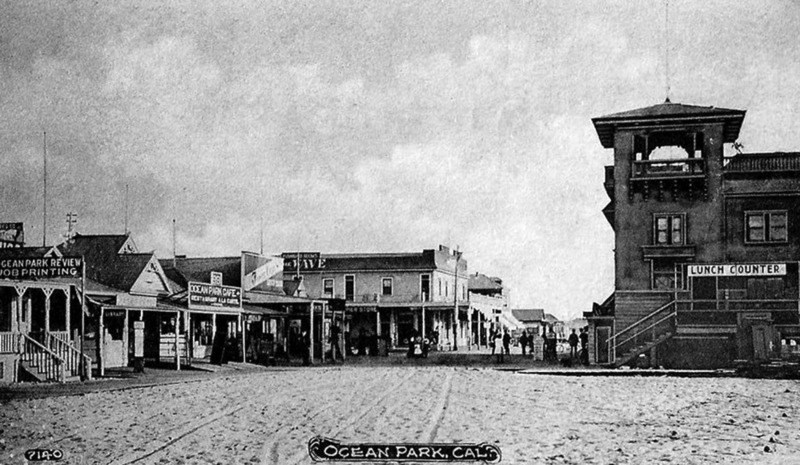 (Early 1900s)^ - An early view down the unpaved Pier Avenue in Ocean Park. Several rail lines can be seen in the street. A bank has been built on the left and other multi-story commercial buildings on the right. The cross street is Trolley Way. 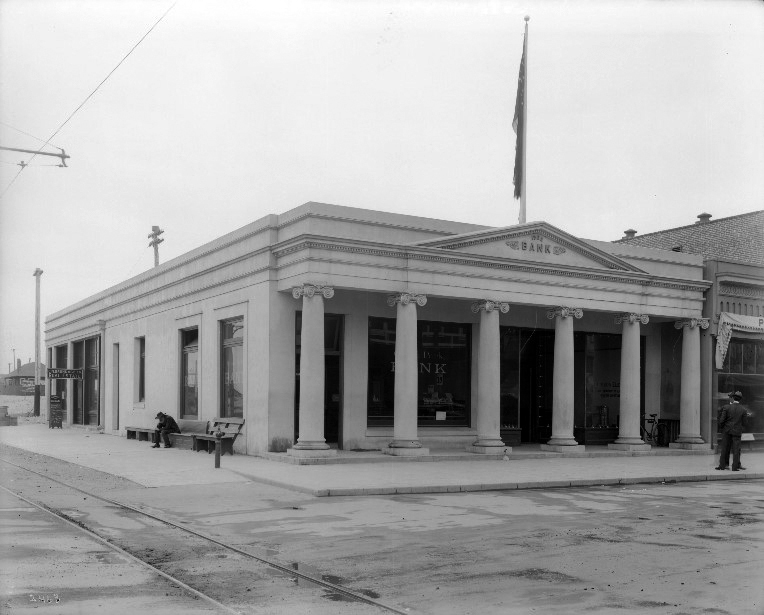 (1905)*^ - View showing Ocean Park Bank located on the southwest corner Pier Avenue and Trolley Way. A man is sitting on a bench on the side of the bank in front of the tracks. The bank resembles a Greek Temple with its columns. 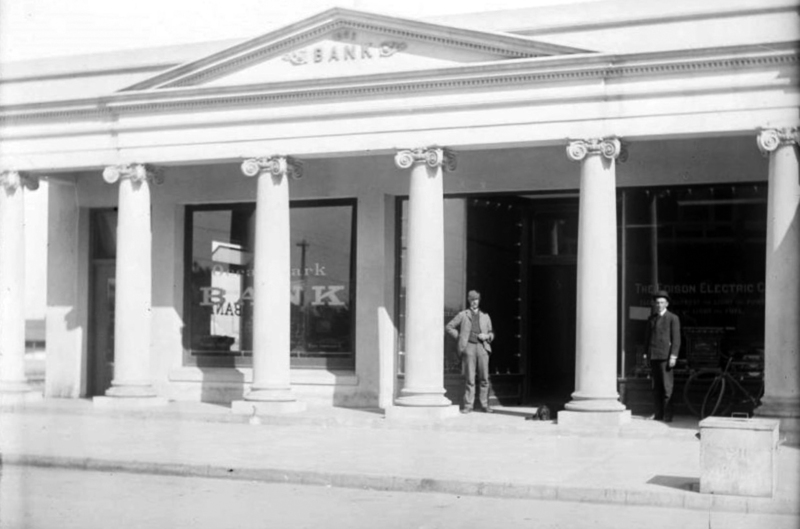 (Early 1900s)**^ - View showing two men standing in front of the Ocean Park Bank on Pier Avenue. The Edison Electric Co. shared the building with Ocean Park Bank. (1905)* - A view down Pier Avenue showing additonal buildings from what was seen three photos back. The street is filled with pedestrians. Cars and horse-drawn carriages are parked in front of the stores on both sides of the street. 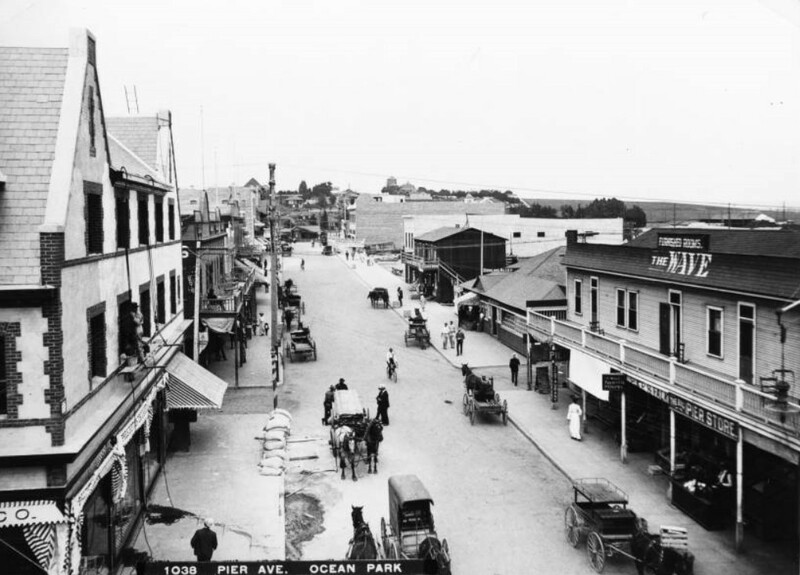 (1904)** – Birdseye view of Pier Avenue in Ocean Park showing many horse-drawn vehicles, September, 1904. The unpaved street is at center is being traveled by several carriages as well as pedestrians and bicyclists. Large buildings, most of which are at least two stories high, line both sides of the street. A wooden building at right has a large balcony, while a brick building at left has three stories. Sand bags are piled up near the street at left. ; Legible signs include, from left to right, "Pier Restaurant", "Wave Furnished Rooms", and "The Big Pier Store". (ca. 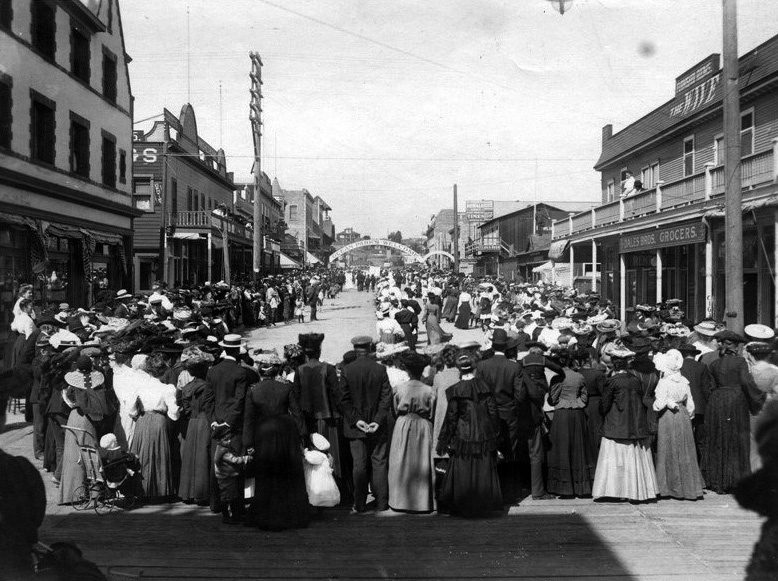 1905)^^^ – View showing Pier Avenue with a crowd of men, women and children (including baby in a baby carriage waiting for some type of parade. The banner over the street reads “Ocean Park’s Welcome”. Buildings include: Dales Bros. Grocers, The Wave (furnished rooms), lunch room. 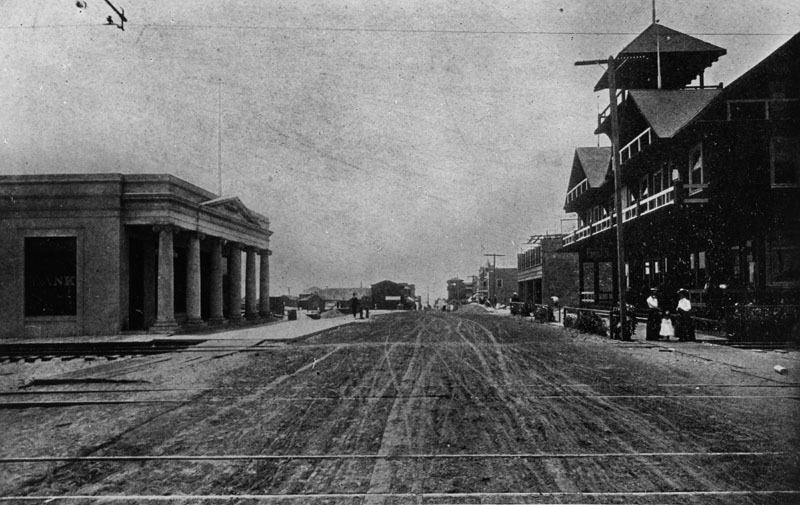 (1915)^.^ - Looking east on Pier Avenue, Ocean Park, Santa Monica. The Wave is on the right. (1915)#*#* – Closer view of Pier Avenue, looking east, showing a line of cars backed up against the curb. Note the new 3-bulb streetlamps. (ca. 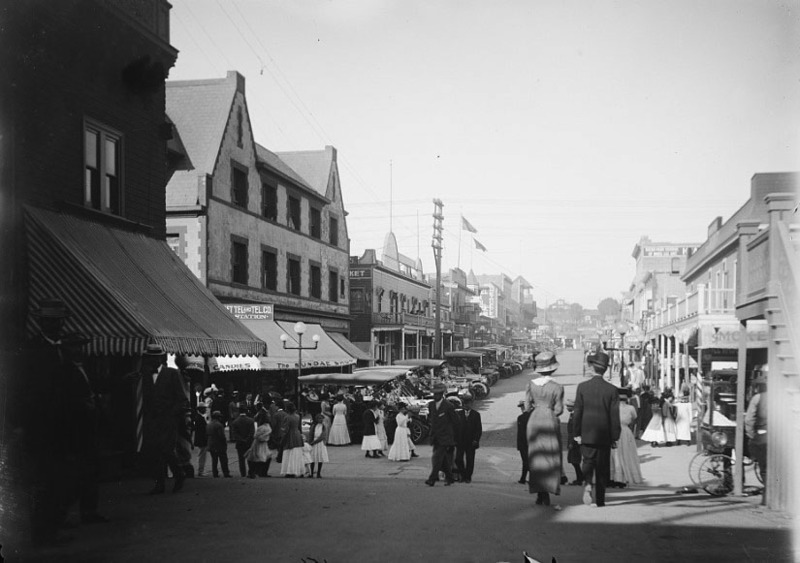 1905)^^^ – View looking down Pier Avenue in Ocean Park. Horse-drawn carriages, early model cars, and people share the street with American flags and banners seen throughout. The Wave w/Furnished Rooms is on the left. 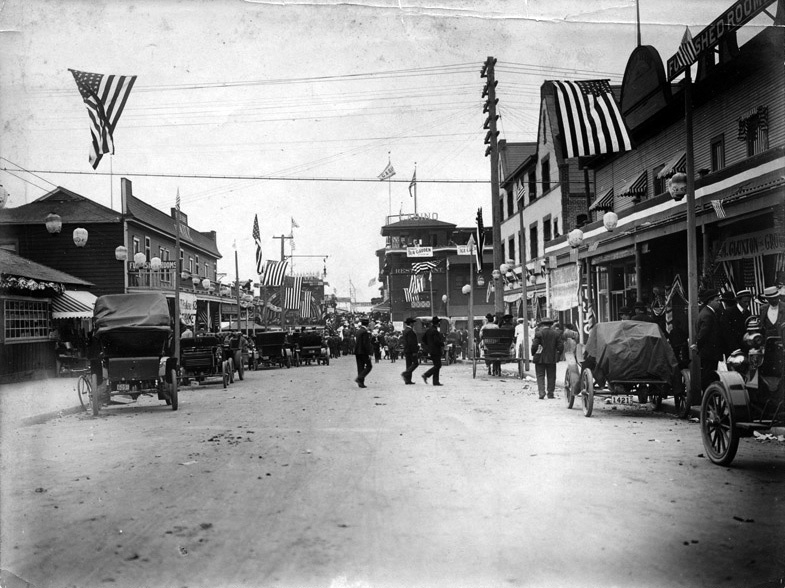 (1905)#^^ - View showing businesses, automobiles, and horse-drawn carriages on Third Street and Pier Avenue at Ocean Park in Santa Monica. Visible signs include "Ocean Park Improvement Company Headquarters Beach Lots" "Casino" "Japanese Tea Garden and Art Curio Rooms, " "Sunset Tel. and Tel. Co. Pay Station" "Manuel-Lopez Habana Cigar" and "Dales Bros. Grocers." There is a statue of a woman at center right. (ca. 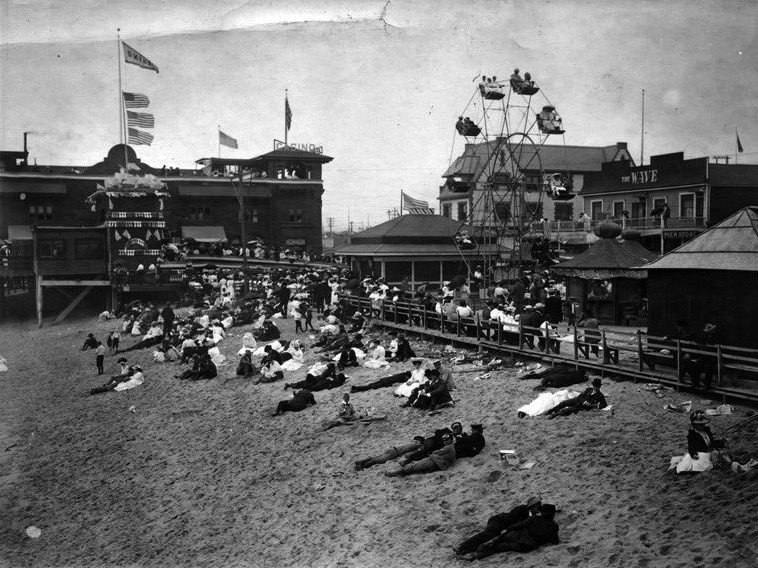 1905)^^^ - View showing Casino Restaurant, theatre, beach crowded with sunbathers, ferris wheel and Pier Avenue in the background. The "Wave w/Furnished Rooms" is on the right. (ca. 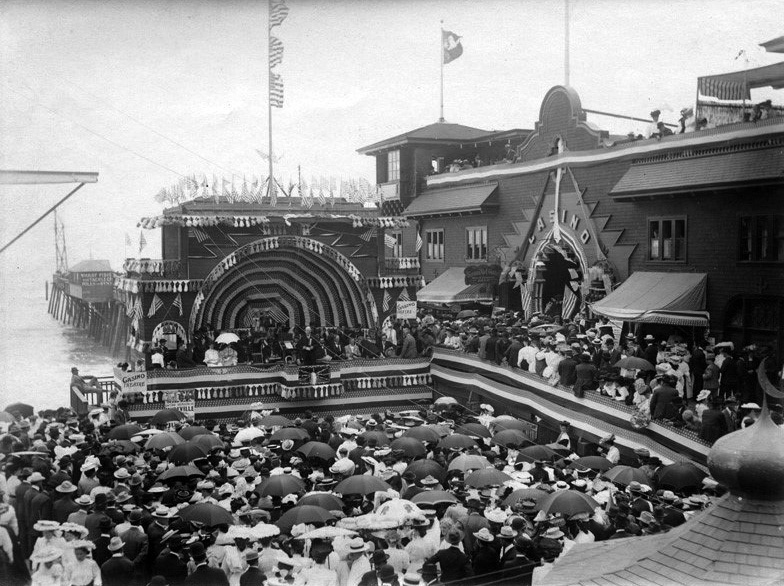 1905)^^^ – View the Casino restaurant and bandstand at Ocean Park in Santa Monica. Crowds of people watch a performance taking place on the bandstand which is decorated with flags and bunting. A wharf extends behind the theatre. (ca. 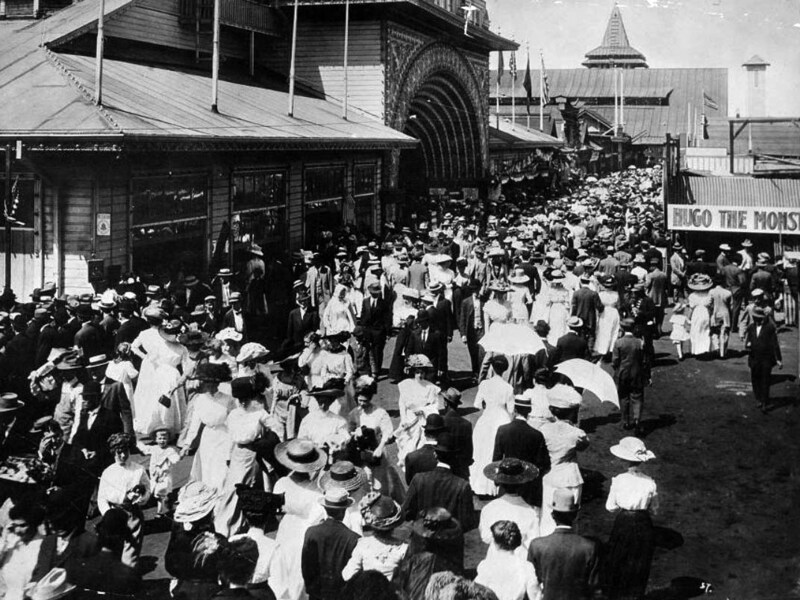 1907)##*^ - View of the Ocean Park Promenade in Santa Monica showing how people went for a walk at the beach – fully dressed with hats, collars, ties, and floor-length dresses. The balcony at top right is where a band would play for the people down below. 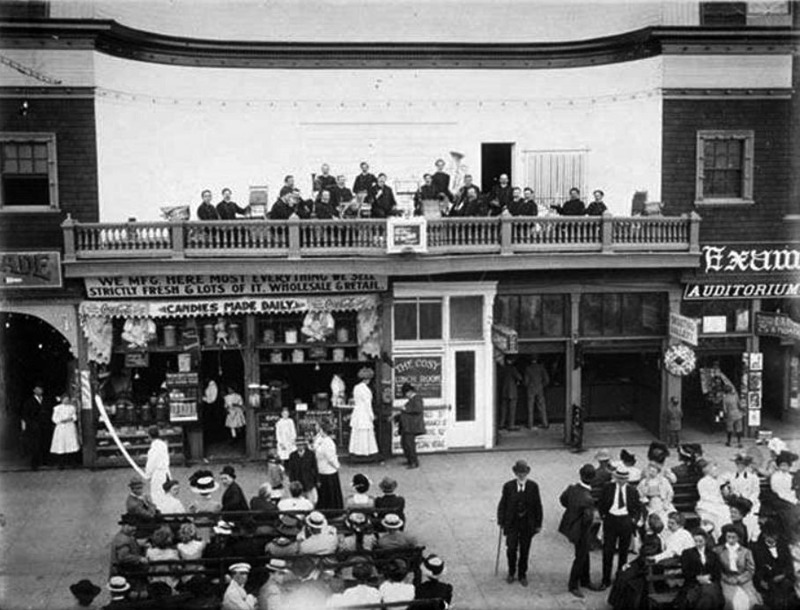 (1909)#^ – View showing Frank McGarry's candy store and Band Plaza, located in Ocean Park between Pier Avenue and Marine Streets. Frank Gregory was the Band Director of the Lincoln Park Band. (ca. 1905)** - Panoramic view looking north at the Pier at Venice Beach showing the amusement park and beach. The Ship Cafe is seen on the left. 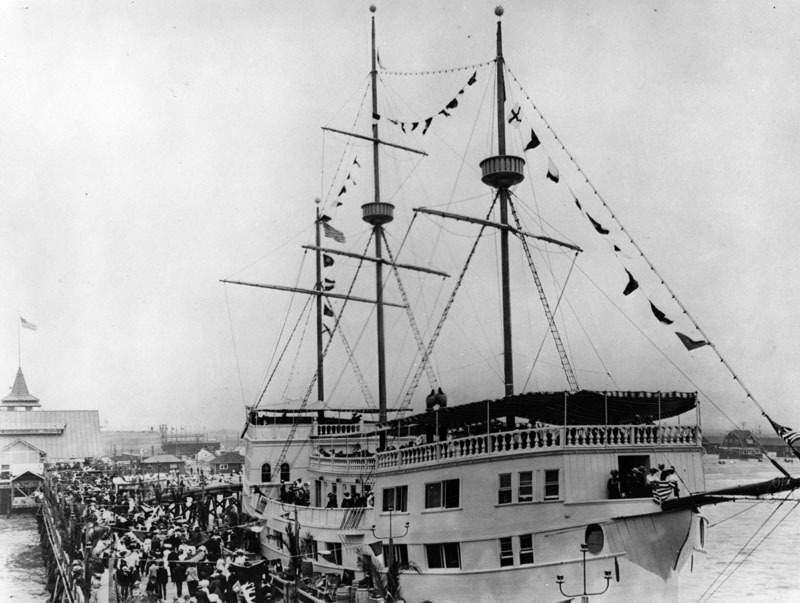 (1905)* - A big crowd is seen behind the large restaurant ship which was a replica of Juan Cabrillo's Spanish galleon. 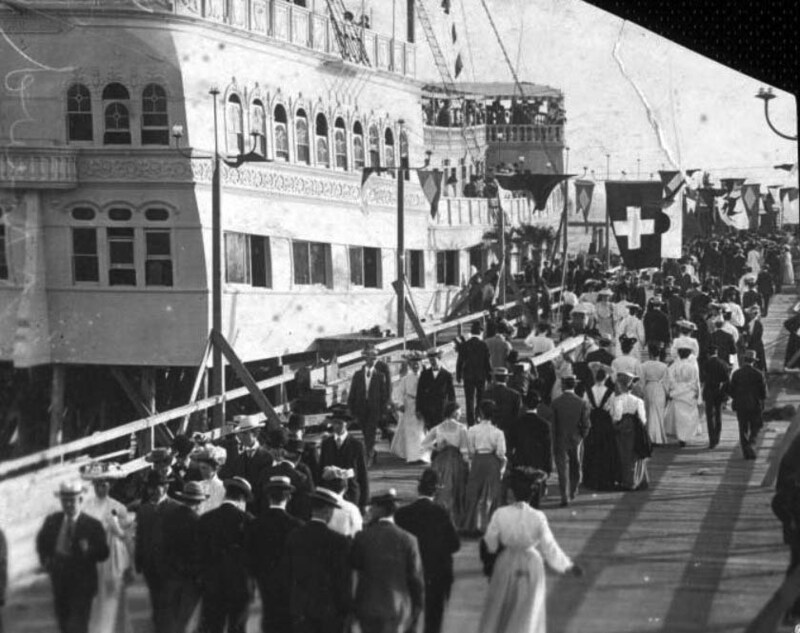 People can also be seen aboard the ship which was located in Venice at the Abbot Kinney Pier. 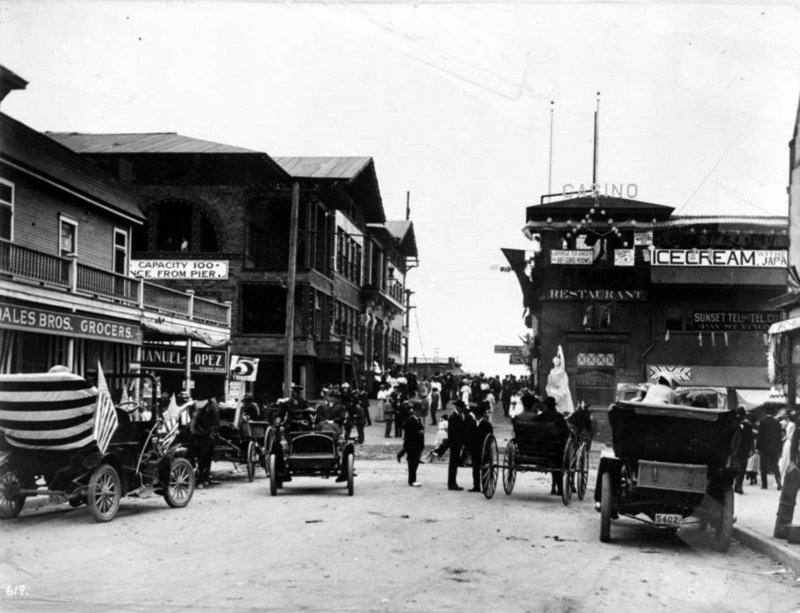 (1906)** – Closer view showing a large number of well-dressed people walking on Abbot Kinney’s Venice of America pier alongside the Ship Café. Handwritten note on verso reads: "Ship Cafe / Venice, Cal. 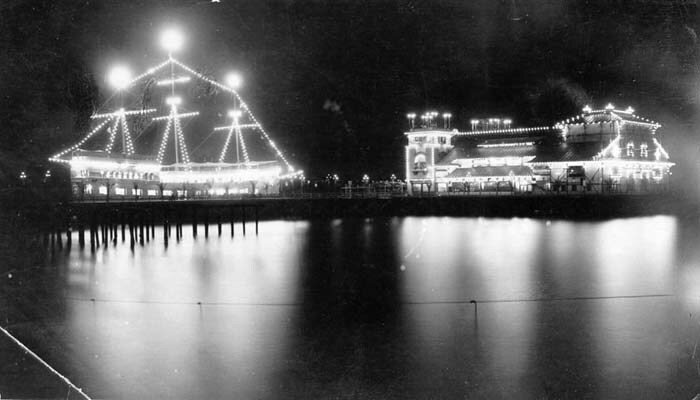 / 12-16-06"
(1905)* - Nigthtime view of Abbott Kinney's Pier in Venice. The pier was destroyed by fire in 1920. (ca. 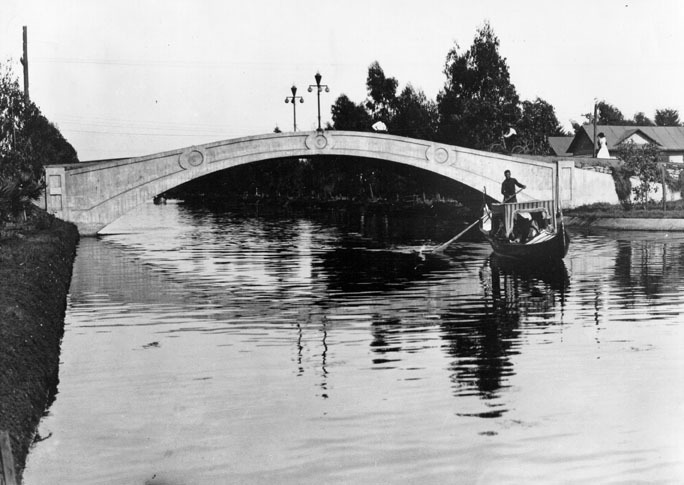 1905)*^ - A gondolier and boat passes under one of the bridges on the canal route. At the same time a pedestrian and a bicycle rider are passing over the bridge. (ca. 1905)*#** - View of the Venice Miniature Railway train crossing over a Venice Canal bridge on its way back to Windward Avenue at the Venice of America Amusement Park. (1912)* - Postcard view of the Miniature Railway on Windward Avenue in Venice. 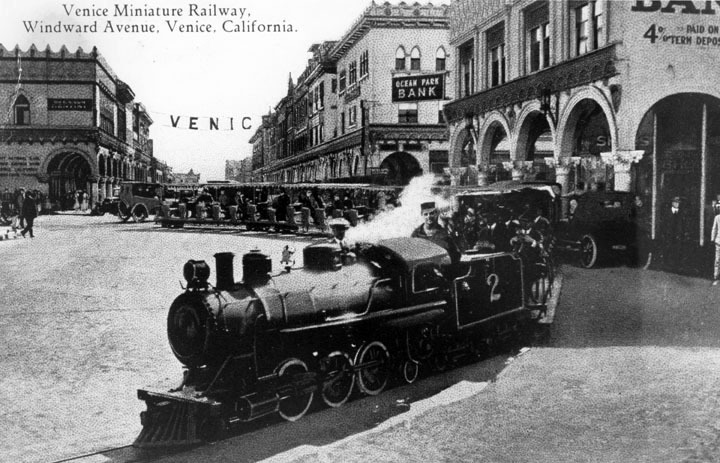 The miniature railroad would carry passengers for trips around the Venice streets, including Windward Ave. as shown here, and around the canal area. (ca. 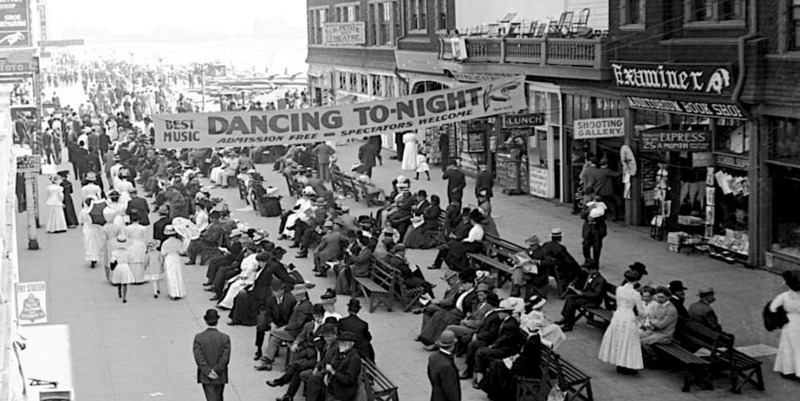 1905)** - Several people stroll by the Dance Hall on the Amusement Pier at Venice Beach circa 1905. "Dance Hall / Venice" -- handwritten note on verso. 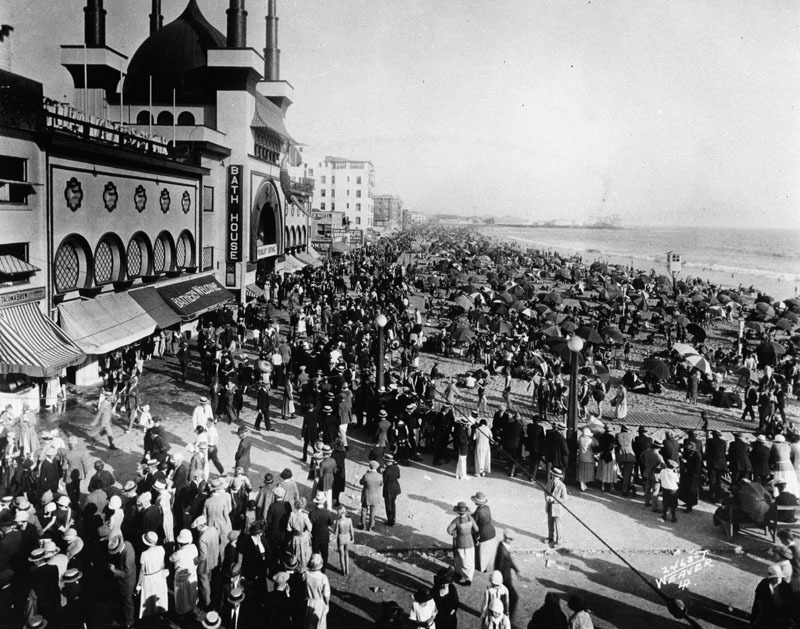 (1908)** - Venice Pier on a crowded day with the Dance Hall seen in the background. (ca. 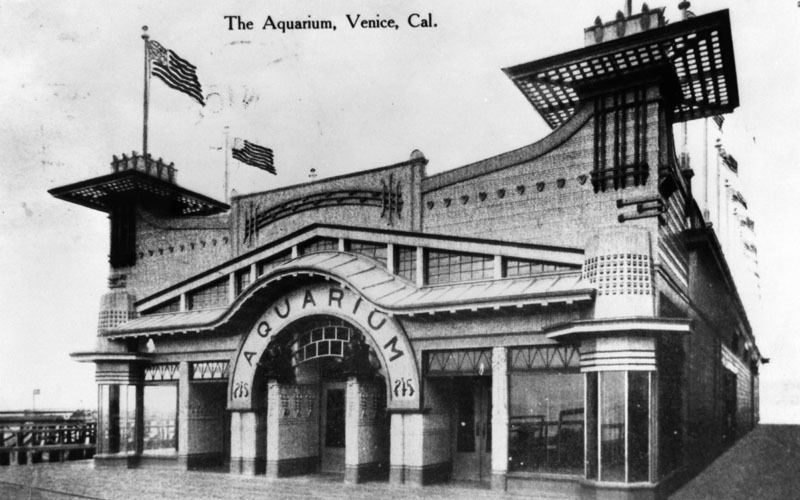 1908)* - A view of the front of the Aquarium, with flags flying all around the top of the building. 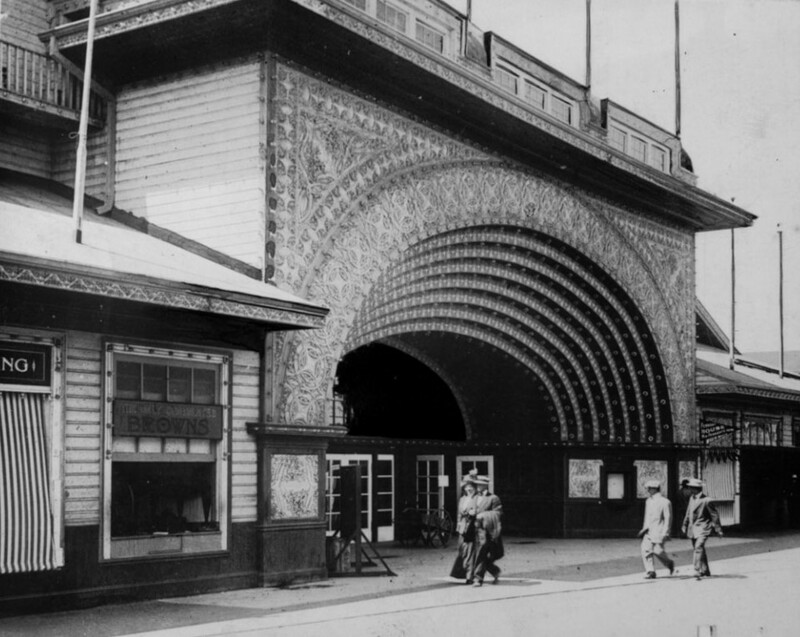 Click HERE to see more in Early Southern California Amusement Parks. (ca. 1900)** - View of a crowded North Beach in Santa Monica with the pier in the background. The boardwalk is also full of people enjoying what appears to be a nice day at the beach. (ca. 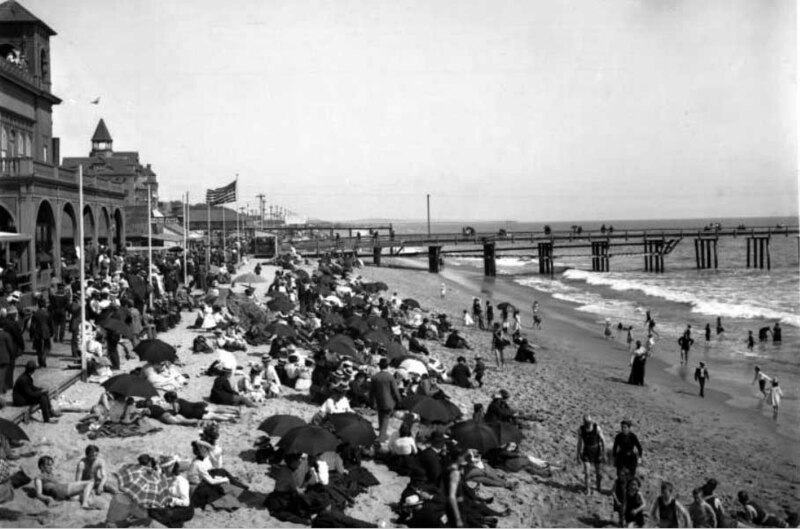 1900)* - Photo of men wearing suits and finely dressed women, sitting on the sand, standing and walking the boardwalk at North Beach in Santa Monica. The North Beach Bathhouse pier can be seen in the background. 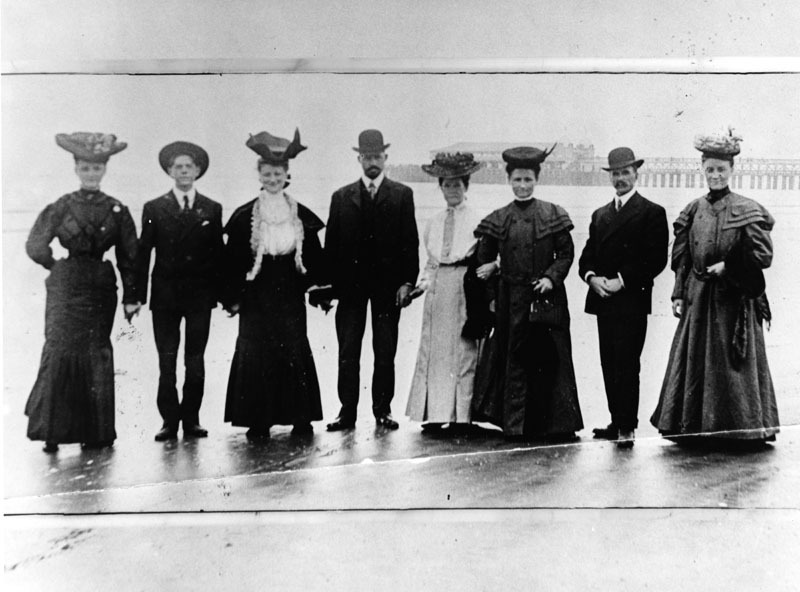 (Early 1900s)* - Group portrait of eight people, finely dressed, standing on the beach. The pier can be seen in the background. (ca. 1900)** - View of eleven young men and women knee-deep in the ocean posing for the photographer. 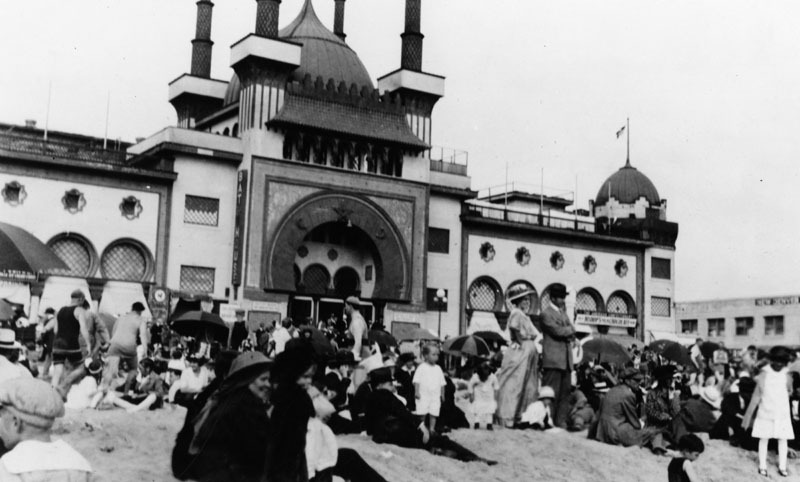 (1905)* - Crowds of people wearing their fine dress are seen strolling along the boardwalk and sitting on the beach, in front of the North Beach Bath House in Santa Monica. (ca. 1900)^#* - Interior view of the North Beach Bath House. (ca. 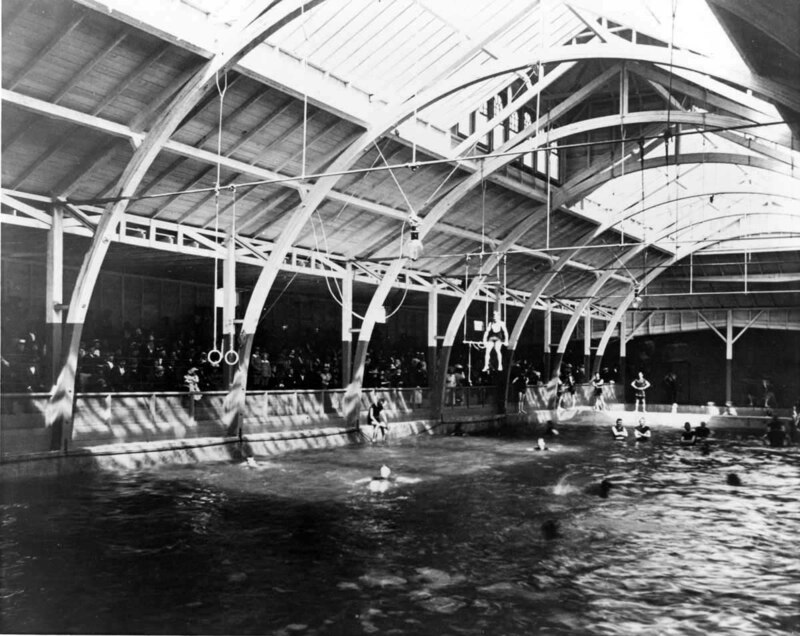 1900)* - View of the indoor plunge in Santa Monica-Ocean park. 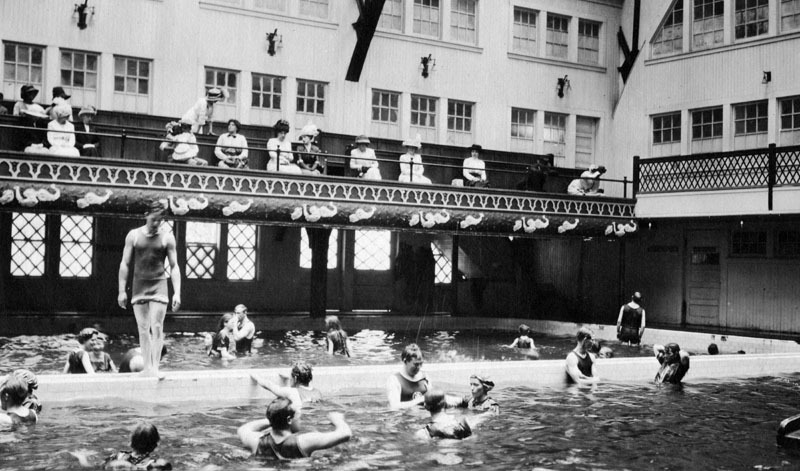 Several people are swimming while spectators (in street clothes) watch from the bleachers along the side. 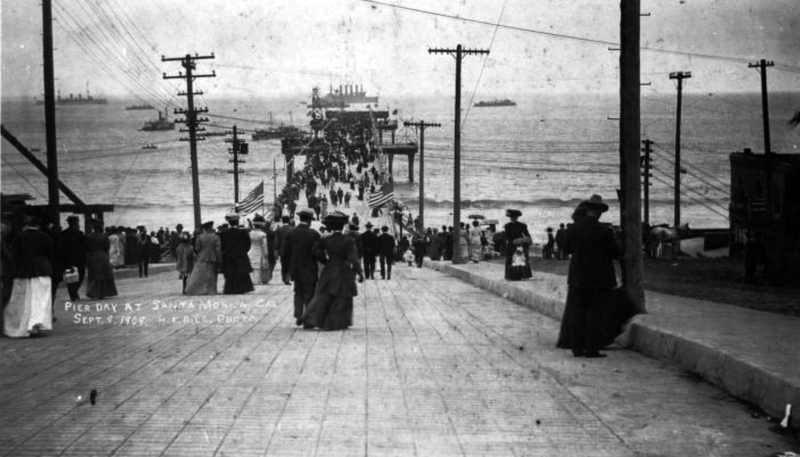 (1909)#^^ - View showing people walking onto the Santa Monica Municipal Pier on Pier Day, September 9, 1909, in Santa Monica. In the distance United States Naval vessels are seen anchored offshore for the event. (1909)^x^ – Postcard view showing the newly constructed Santa Monica Municipal Pier on opening day, September 9, 1909. The above postcard was produced to advertise the Balloon Route Excursion, a daily trolley car site-seeing route that operated under the management of C. M. Pierce (and the Los Angeles Pacific Co.) between 1904 and 1911. Printed on front: Longest concrete pier in the world, 1600 ft. long. On reverse: Balloon Route Excursion, The Scenic Trolley Trip. Paralleling the mountains from Los Angeles to the ocean, then 36 miles along the Seashore. Parlor Cars; Reserved Seats; Competent Guides. Free Attractions - An ocean voyage on wheels, the cars running a mile into the ocean on Long Wharf, Port Los Angeles; Admission to Largest Aquarium on Pacific Coast; Ride on the L.A. Thompson Scenic Railway at Venice; Admission to Camera Obscura, Santa Monica. Last car 9:40 A.M. Daily, 429 South Hill, Los Angeles. (ca. 1909)** - View Santa Monica Beach looking south from the Palisades. The beach is at right, and running next to it is a two-lane paved highway. Making its way parallel to the road is a railroad. There are tall cliffs at left, covered in a variety of plants and trees. A small group of buildings is visible at center near the water, and a long pier (Santa Monica Municipal Pier) juts out into the ocean from near these buildings. There is a shorter pier in the foreground, and two people can be seen walking along the sand at right. (ca. 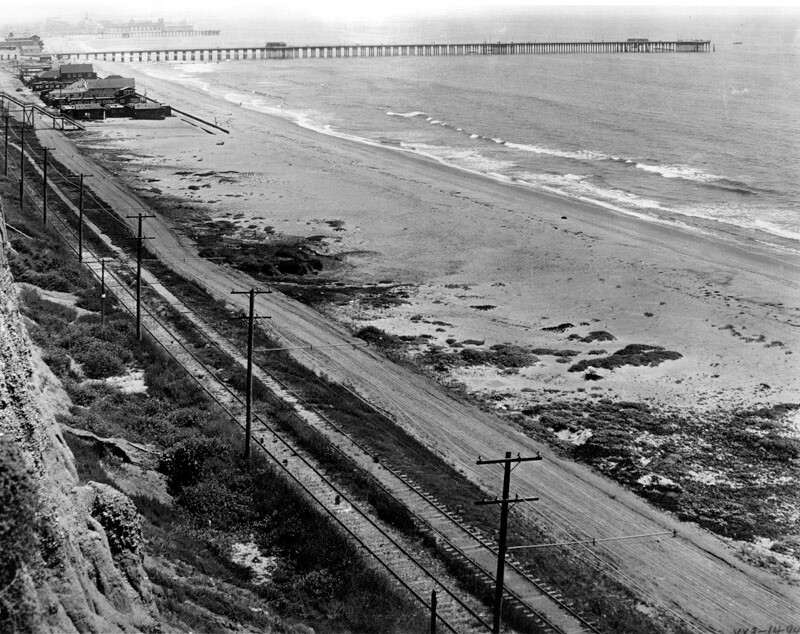 1910)* – Closer view showing railroad tracks running parallel to an old dirt road along the Santa Monica beach front. This site is now the Roosevelt Highway. In the background can be seen Santa Monica Municipal Pier. (ca. 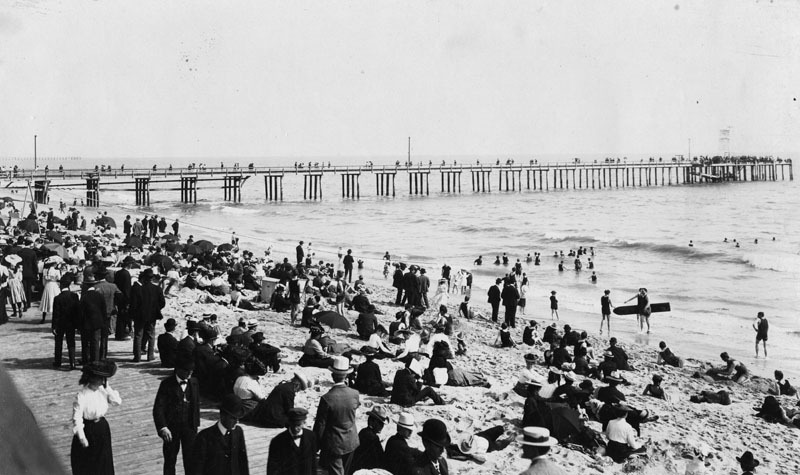 1908)## – Panoramic view looking south from Ocean Park Pier in Santa Monica. 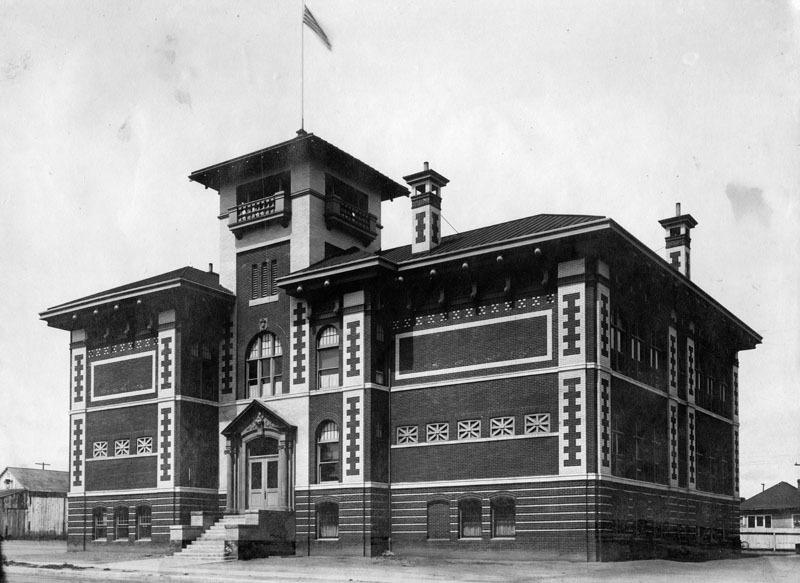 The beautiful Ocean Park Bath House, built in 1905, is seen on the left. 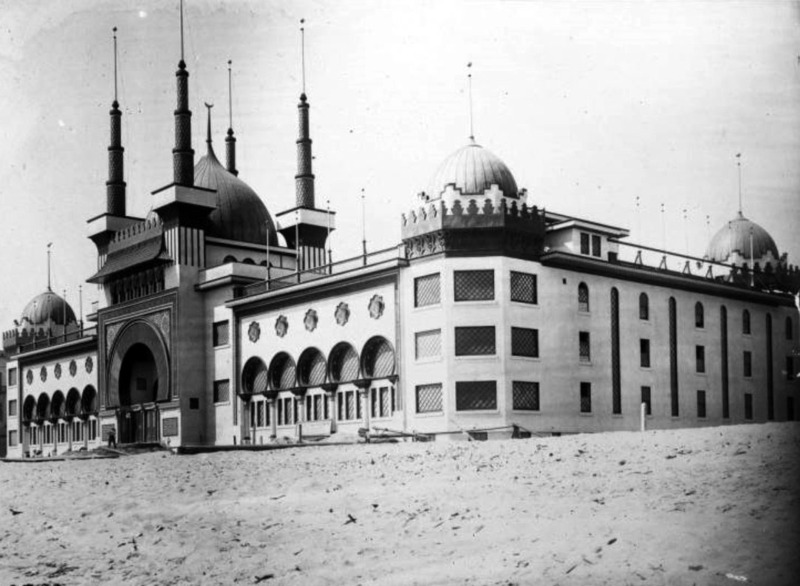 (1905)** - View of Moorish style Ocean Park Bath House, nearing completion. Round turrets rise from each of the corners as well as over the main entrance. Rows of arched or round windows line the exterior of the three-story building on the beach. Laborers are seen working near the entry. (ca. 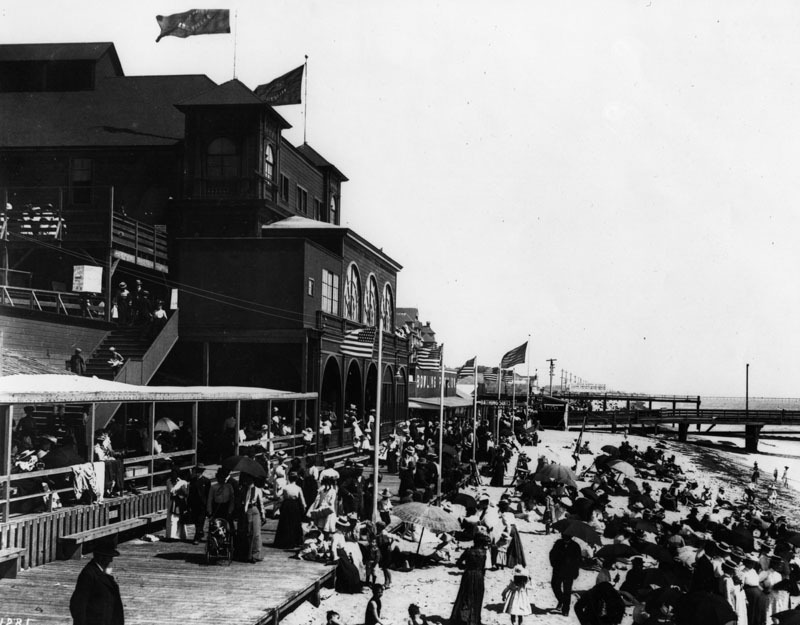 1910)#^^ – Panoramic view showing people on the beach in front of the Ocean Park Bath House at Ocean Park, in Santa Monica. 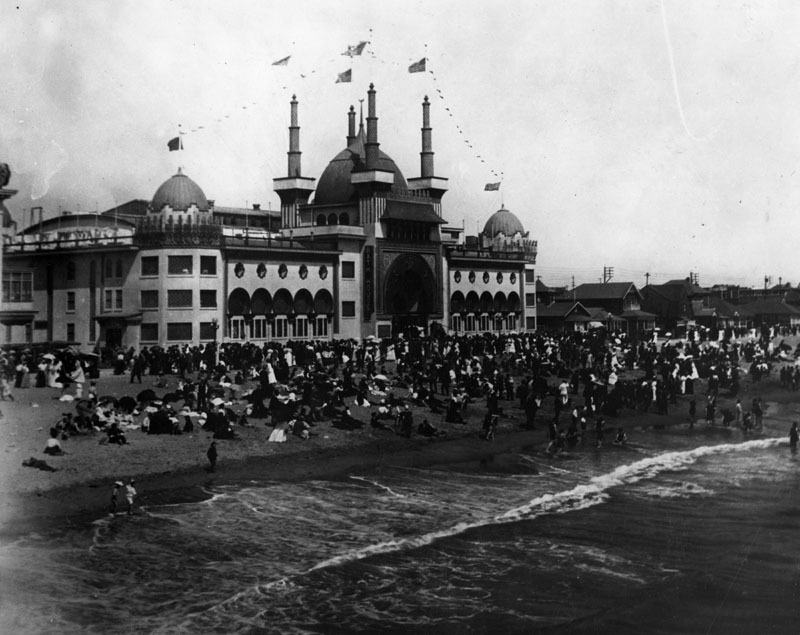 (Early 1900s)* - Crowded shoreline in front of the Ocean Park Bathhouse at Ocean Park Beach. 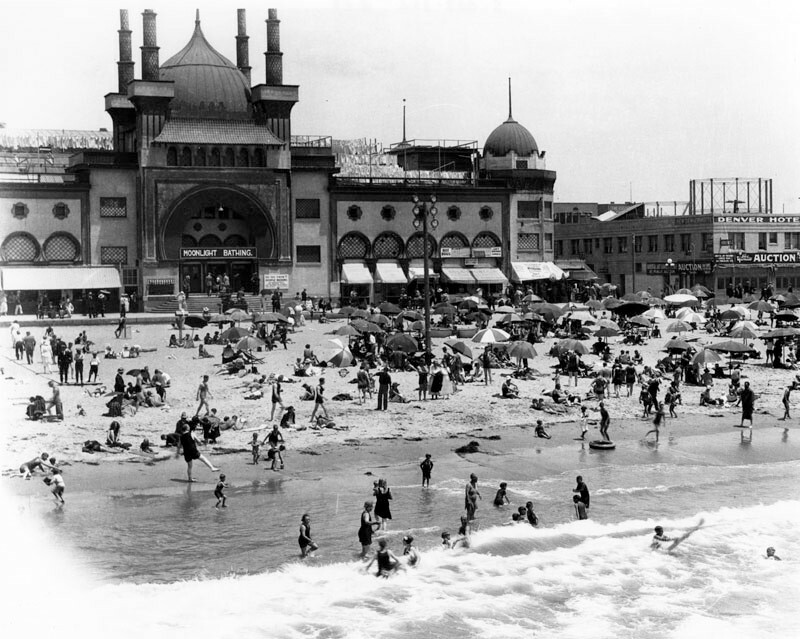 (Early 1900s)* - Heavy crowd day on the beach and in front of the Ocean Park Bath House. (ca. 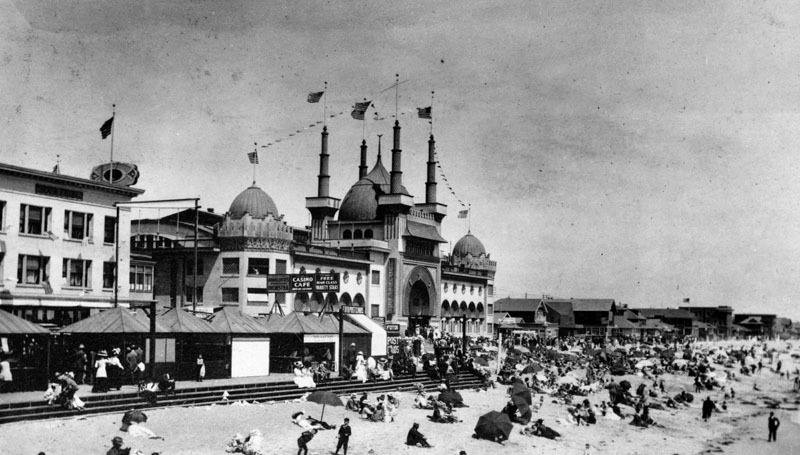 1910)* - A view of the bath house set along the beach in Ocean Park. Hundreds of visitors are sitting or standing on the beach and in the rolling waves of ocean water. 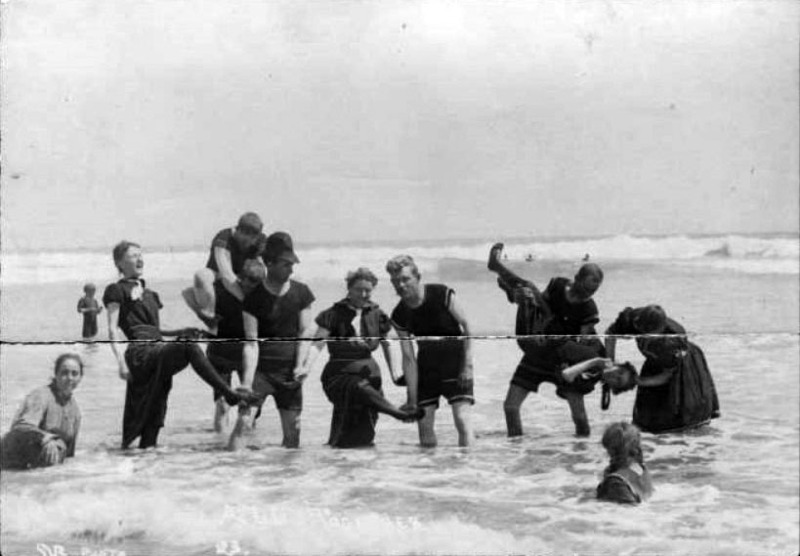 (Early 1900s)* - Crowded beach at Ocean Park in front of the Bath House. (ca. 1920)** - Exterior view of the Ocean Park Bath House in Santa Monica from the pier. The bath house is at center and is a large Moorish-style building. At the center of the building is an elaborate entry way consisting of a large domed tower surrounded by four tall spires. Smaller domed towers occupy the corners of the buildings. Awnings project from the bottom story of the building, and rows of round windows occupy the second and third stories. 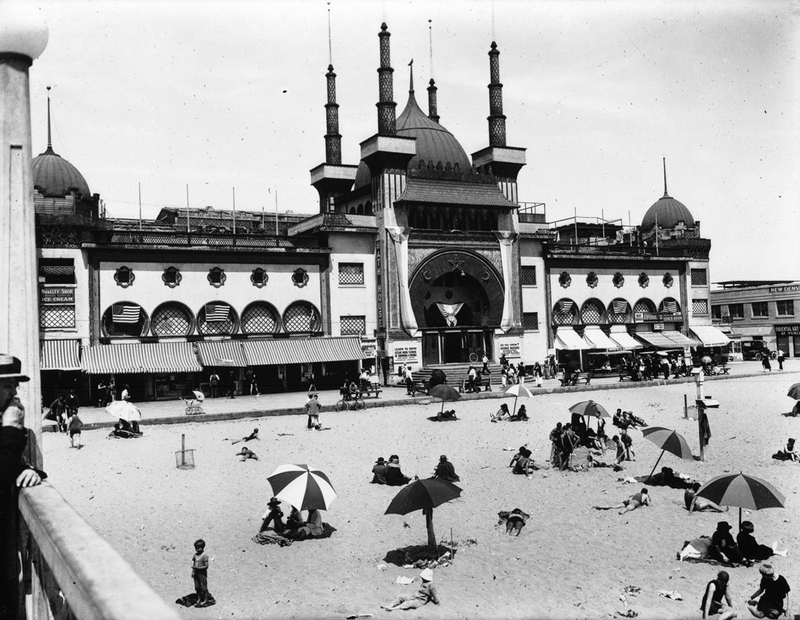 (1921)*^ - A view of the beach and ocean water with the Ocean Park Bath House in the background, offering (sign over the door) moonlight bathing. To the right is a building Denver Hotel with a sign below it announcing Yosemite Auction. (ca. 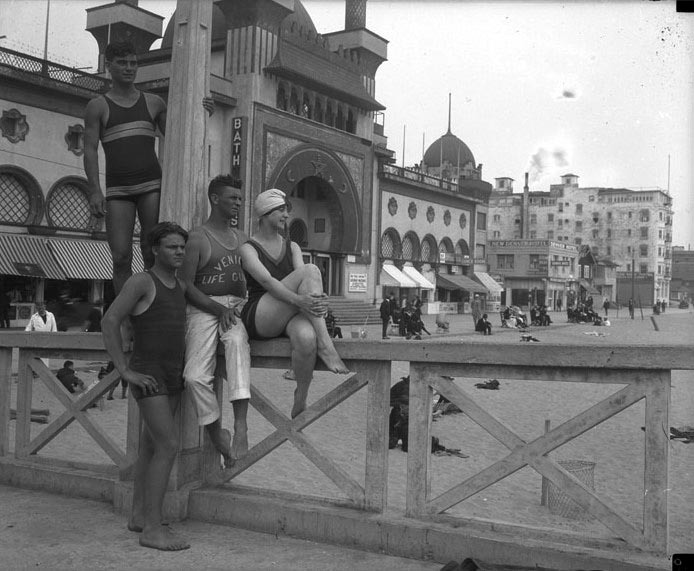 1925)#*#* - Bathers and lifeguard on boardwalk in front of Ocean Park Bath House. 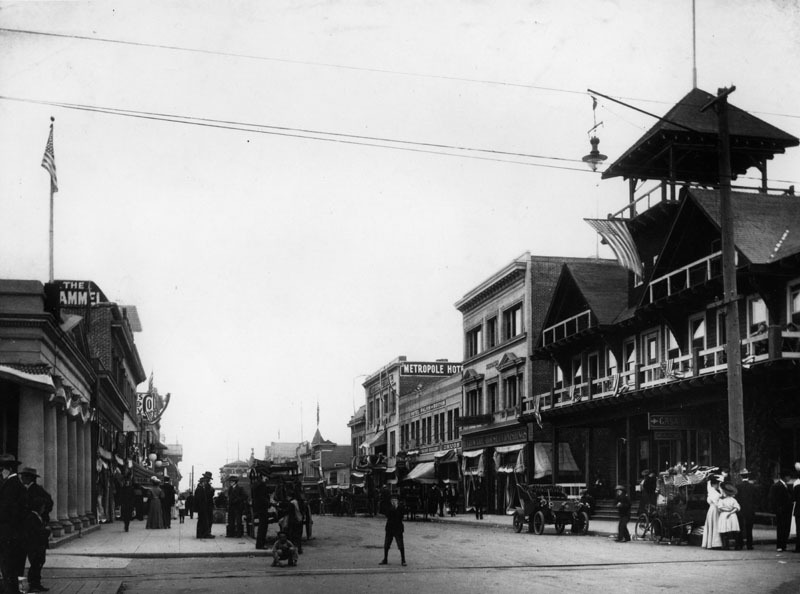 (1910)* - View shows two automobiles driving on the 400 block of 3rd Street in Santa Monica. The Adelaide apartments can be seen on the left. Today, this is the Thrid Street Promenade. 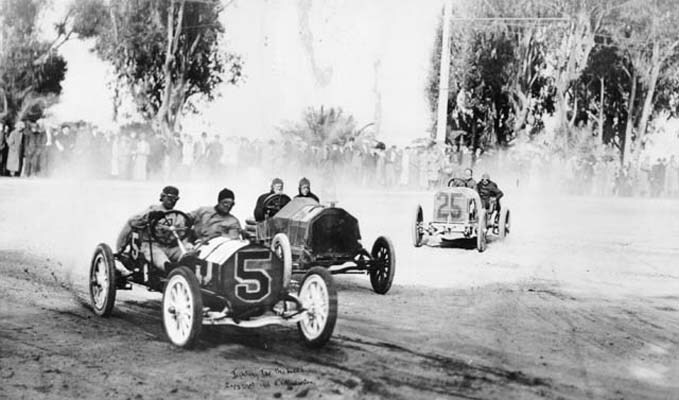 (1912)#^ - Wilshire Boulevard (then Nevada Street), a section of the fastest road race course in the world (promotional brochure), Santa Monica. 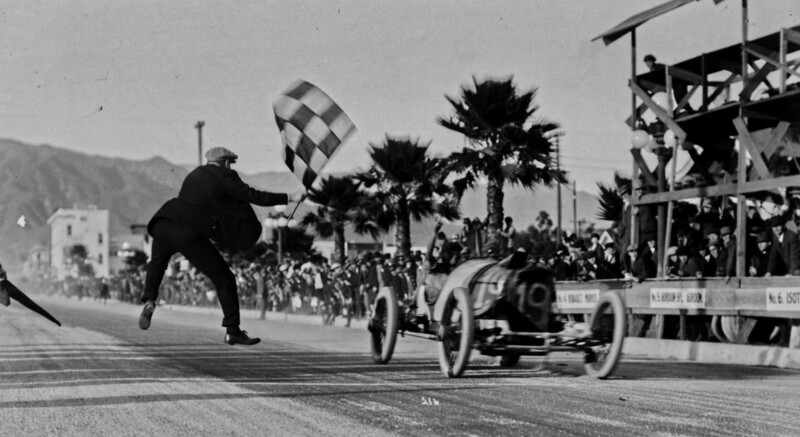 Santa Monica was known for its annual road race--an event that took place from 1909 through 1919 (with a 1917-18 hiatus because of America's involvement in World War I). 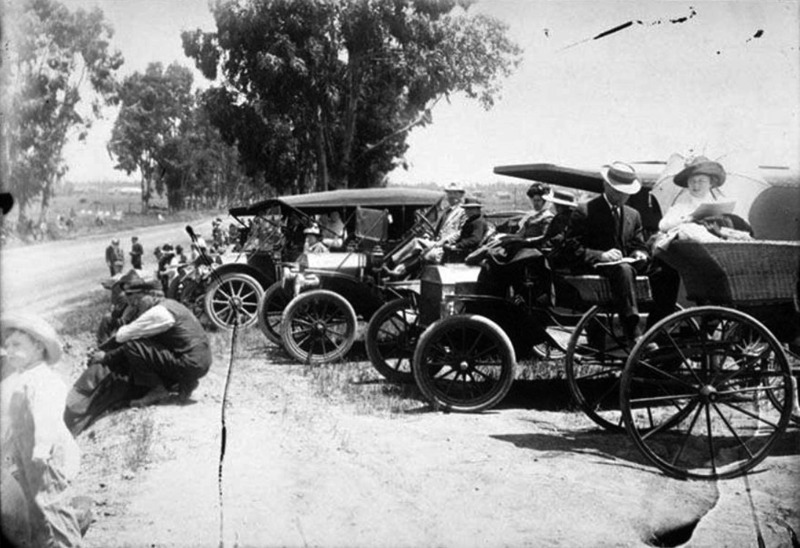 (1912)#^ – Close-up view showing spectators on the side of the road and in their automobiles on Nevada Avenue (later Wilshire Boulevard) waiting for the Santa Monica Road Race to begin. (ca. 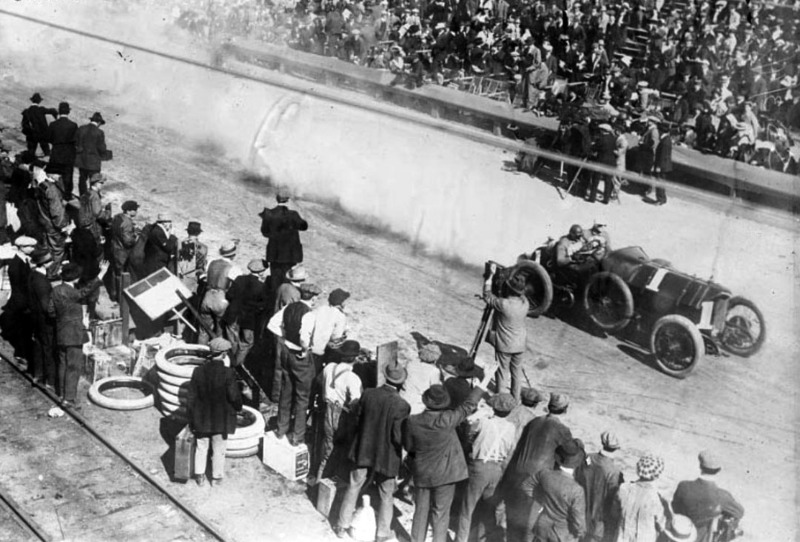 1912)* - Two-man race cars take a turn and kick up dust as spectators watch from the side of the dirt road. 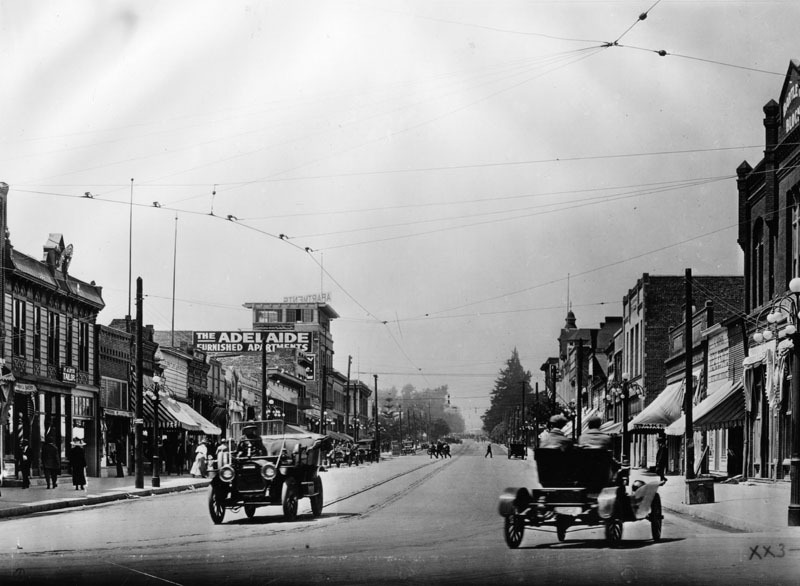 The course covered San Vicente Boulevard, Ocean Avenue and Wilshire Boulevard (then named Nevada Avenue). 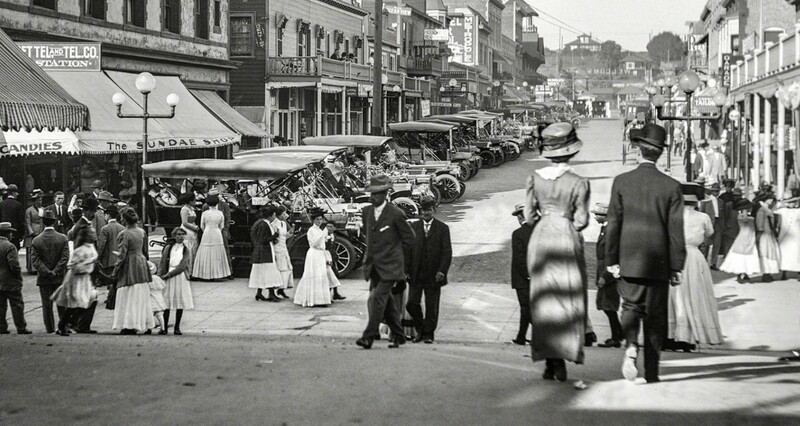 (1910)** - A crowd watching an automobile race near Ocean Avenue in Santa Monica. The cars have just turned from Ocean Avenue onto Nevada Avenue (later Wilshire Boulevard). This was called the "Death Curve". 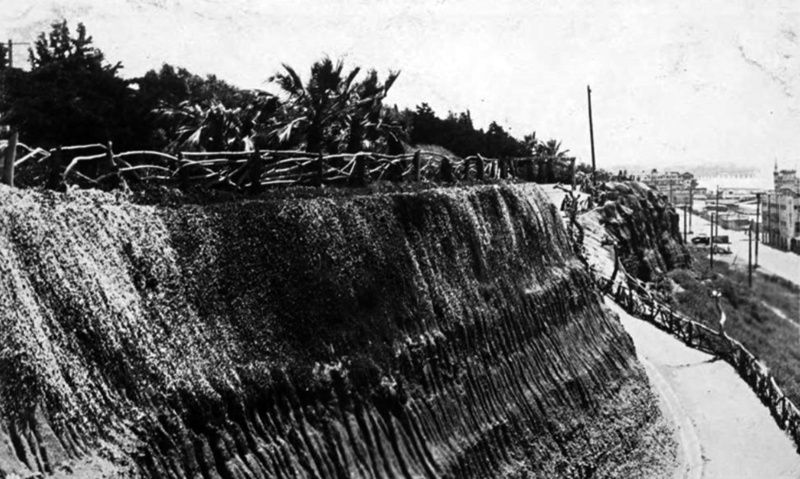 (1914)+++ – View showing the "Death Curve", located at the corner of Ocean Avenue and Wilshire Boulevard. (1914)+++ - Harry Grant, two-time winner of the Vanderbilt Cup Races, driving the #1 Isotta passes the grandstands on the east side of Ocean Avenue. 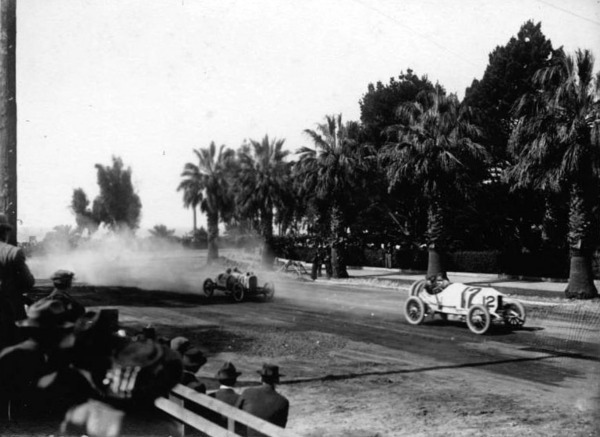 Both the 1914 and 1916 Vanderbilt Cup Races were held on the beautiful Santa Monica road course bordering on the Pacific Ocean. (ca. 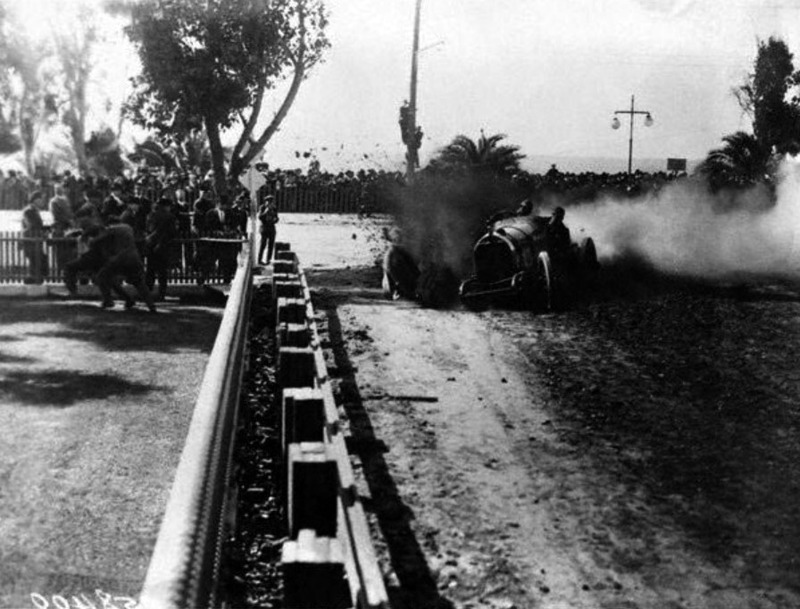 1916)^^+– View showing the dramatic Santa Monica finish line where Eddie O'Donnell takes the checkered flag in his Number 19 Duesenberg. 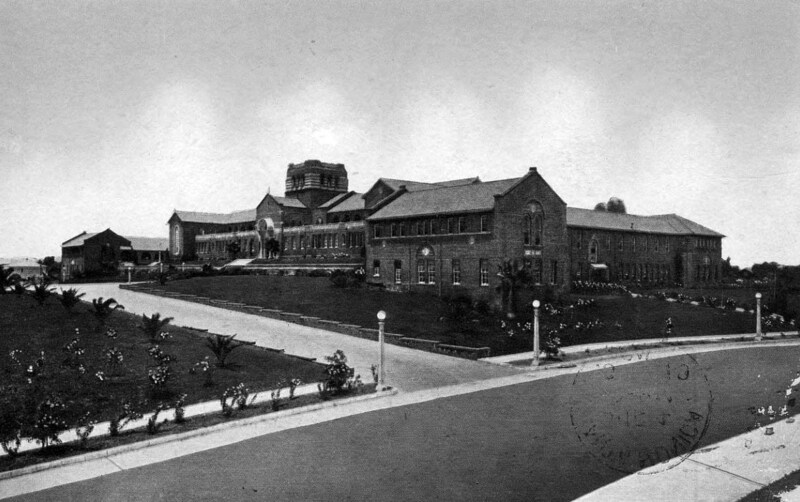 (1910)* - Exterior view of Jefferson School located at 1333 Sixth Street in Santa Monica. 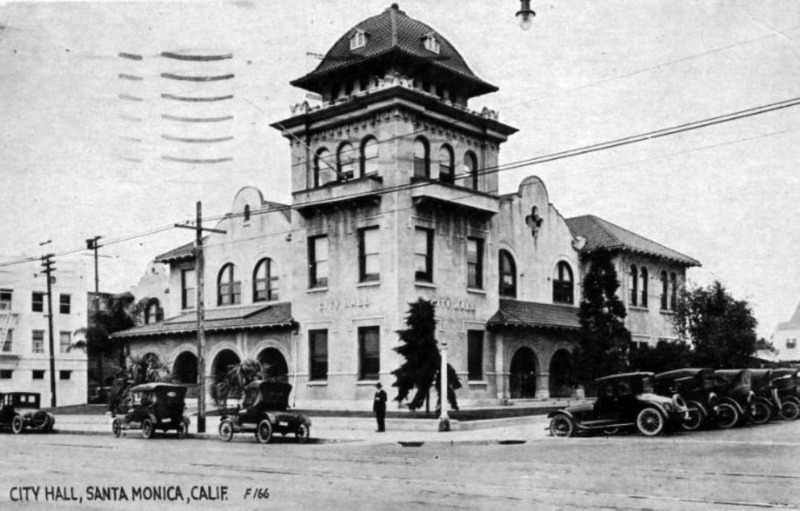 (1903)#^ - Exterior view of Santa Monica City Hall the year it was built, located at the southwest corner of 4th and Oregon (Santa Monica Boulevard). Architect: Carol Brown, addition by Henry Hollwedel. (ca. 1917)#^# – Postcard view showing the old Santa Monica City Hall, located at Santa Monica Boulevard and Fourth Street. 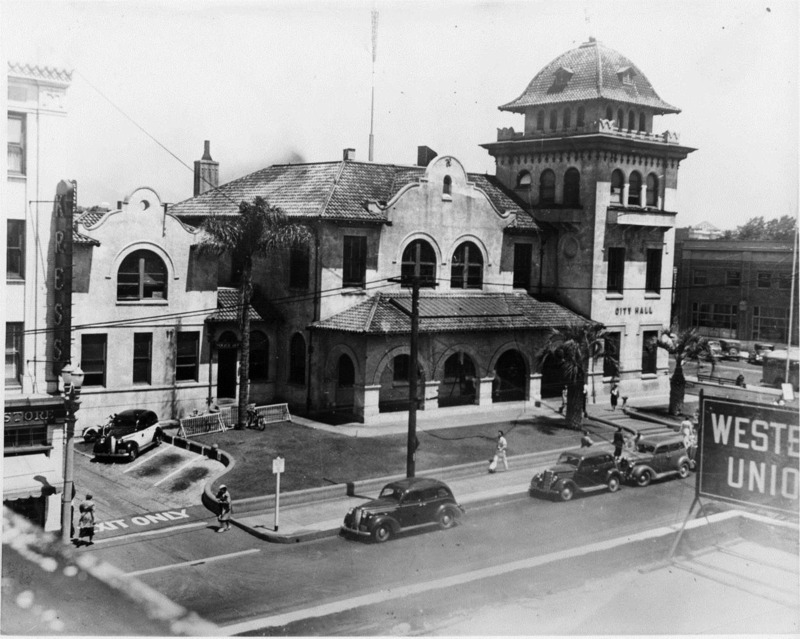 (1930s)^#* - View of the old City Hall as it appeared in the 1930s. The building shared space with the Police Dept. 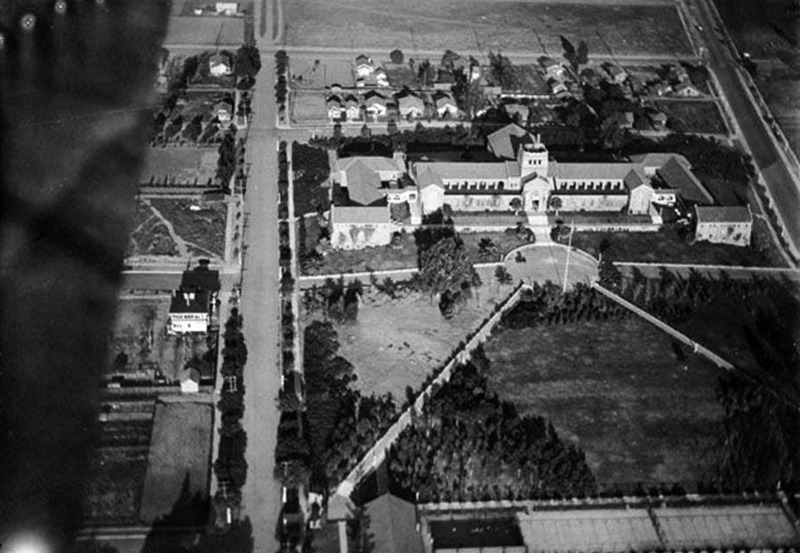 (1916)#^ – Aerial view of Santa Monica High School, located at 601 Pico Boulevard. (ca. 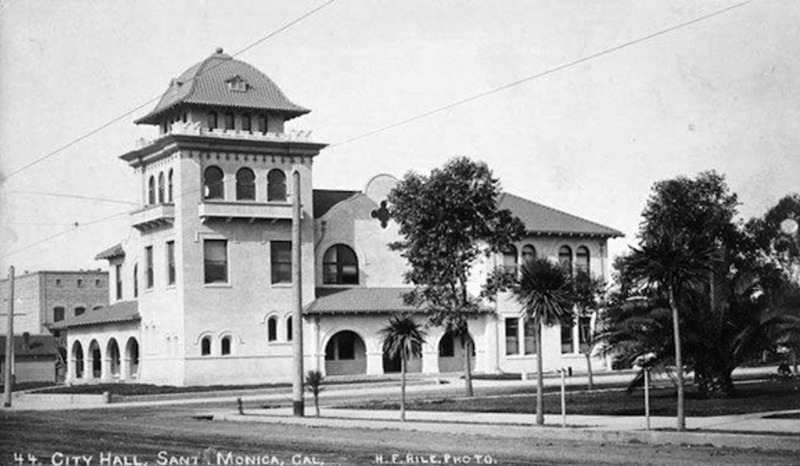 1919)*^ - Postcard view of Santa Monica High School located at 601 Pico Boulevard. (ca. 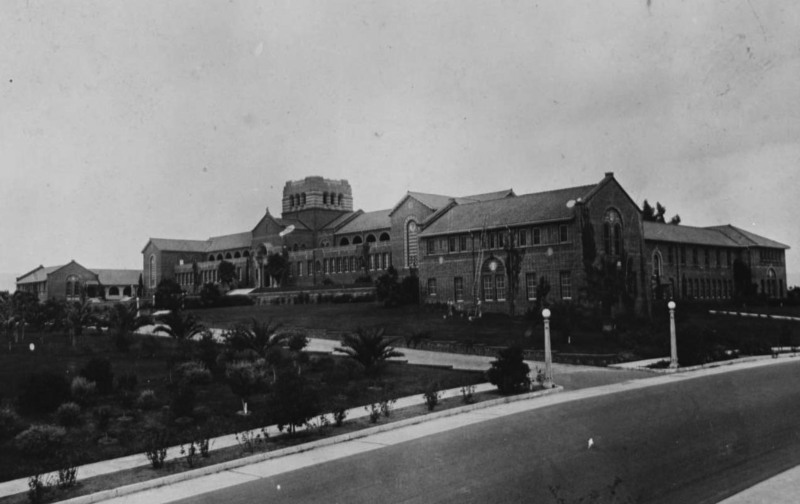 1922)#^^ - Image of the main entrance wing of Santa Monica High School and grounds on Pico Boulevard in Santa Monica. 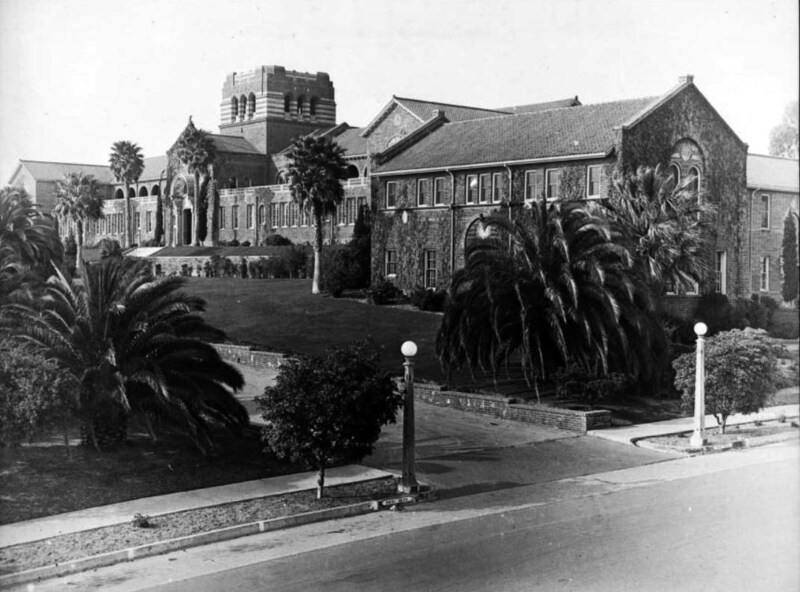 (1924)** - Exterior view of Santa Monica High School, showing the main entrance and right wing. The main entrance to the multi-story brick building is seen at left center. The right wing, its walls covered in ivy, protrudes toward the foreground. The building is fronted by lawns and palm trees. A paved street and sidewalk run diagonally through the lower right of the image. The high school building was erected in 1912 and replaced during 1936 and 1937. 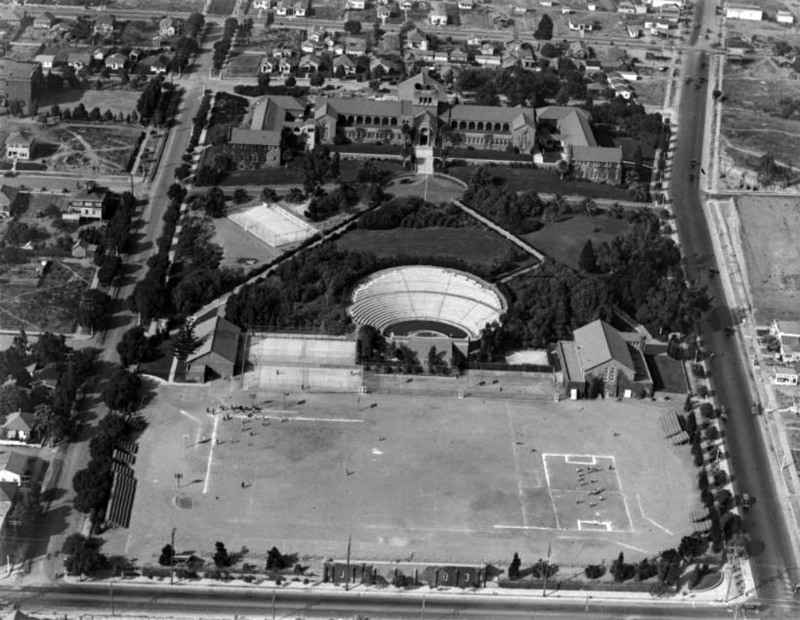 (1925)#^^ - Aerial view of the Santa Monica High School campus showing the athletic field and Open Air Memorial Theater (later renamed the Memorial Greek Amphitheatre) bordered by 4th Street at bottom and Pico Boulevard at right. In 1921, the Open Air Memorial Theatre (now called the Greek Amphitheatre) was built to honor the Santa Monicans who served in World War I. One of the best examples of the classical Greek style in Southern California, the amphitheatre was built after Santa Monica passed a $30,000 bond measure to fund its construction. Barnum Hall Theater, originally called "the Auditorium," was built in 1937 by the Works Progress Administration (WPA) to be the Civic Auditorium of Santa Monica and host school events as well. The campus also added six buildings during this period: the Language, English, Business, History, Administration and Music buildings. In 1952, Santa Monica High School was finally expanded to what it is now, 33 acres, and two new buildings were built, the Science and Technology D.M. buildings. As the school aged, renovations took place in Barnum Hall and the Music building was completely rebuilt.